“Thank-you for choosing West Jet” the email read. My heart sank. While I was unwilling to leave this magnificent landscape, the healing salt air and the gloriously open and warm people, I’d received three pieces of worrying news. It was time. We all make assumptions. 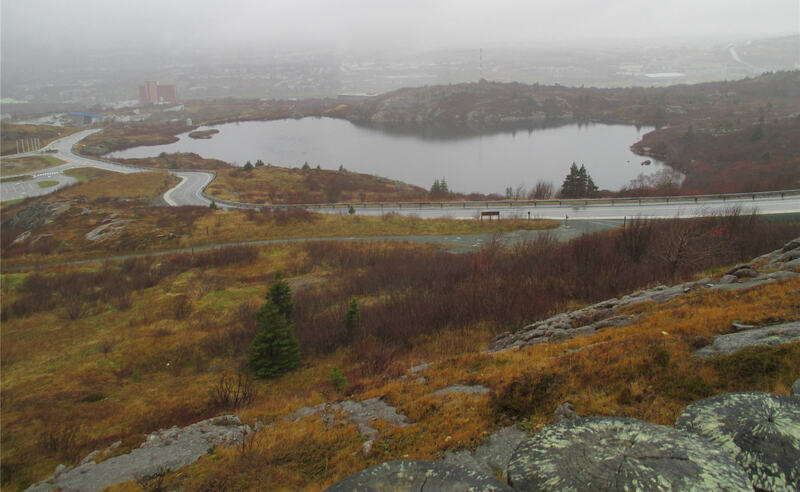 When I arrived, I assumed I’d be living in Newfoundland for the entire fall and winter. 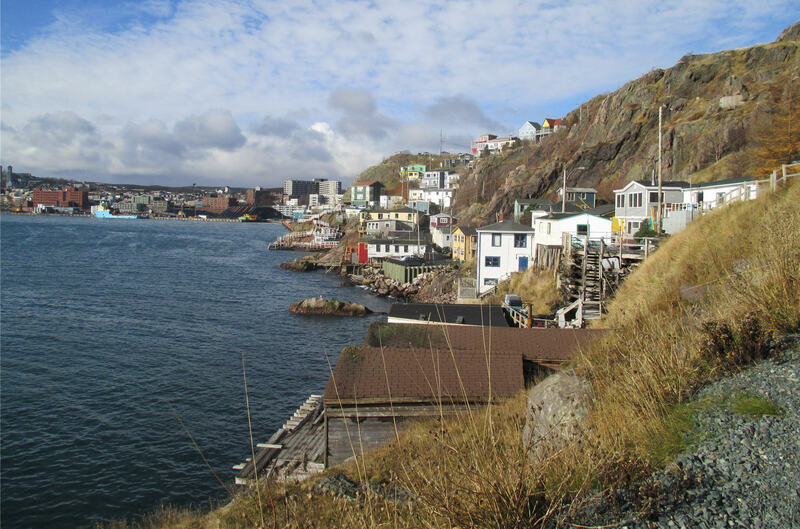 Then last month, medical professionals in St. John’s suggested I was delusional for seeking assistance with an allergic reaction that results in moments of mental confusion and tears. The assumption there is that all allergies attack the lungs: in truth, allergies (especially mould allergies) can attack any major organ. Shortly after I booked my flight to Ontario, a headhunter called my cell begging me to interview for a Toronto technical writer position—one that I hadn’t even applied to. I went to two interviews when I got home, delirious in the thought that maybe this was me returning to my magical life. The interviewing manager declared that my resume sounded like a hippy reliving her youth. With each assumption, I was horrified that we do this to each other, and to ourselves. The universe had been pretty specific: all three pieces of news I received pointed to Kingston. Apparently, my nomadic lifestyle needs to continue, regardless of what I think, and of how others perceive it. 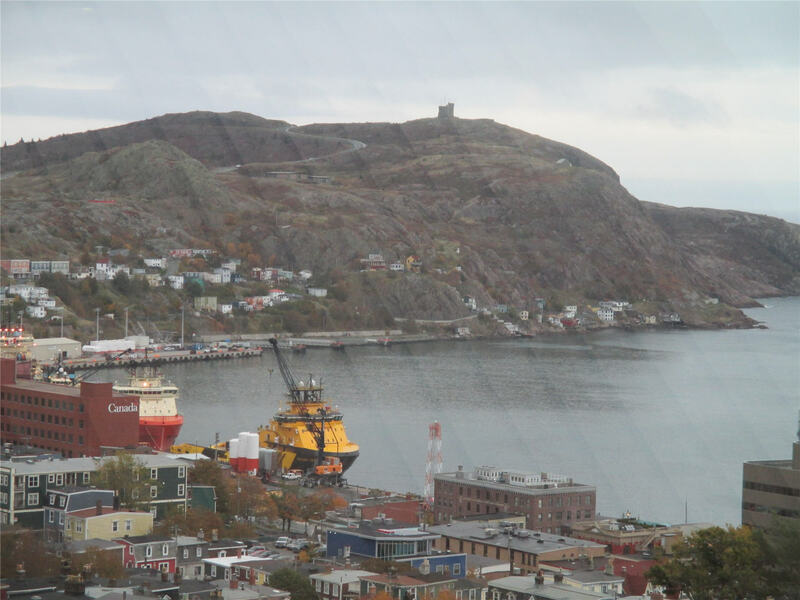 After booking my flight home, I looked out my St. John’s hostel window at the cool, drizzly day and snuffled. “Oh screw this!” I thought, suddenly annoyed at it all. “I’m not going to sit here and wait for tomorrow’s flight.” My nomadic feet needed to be on that rock face. 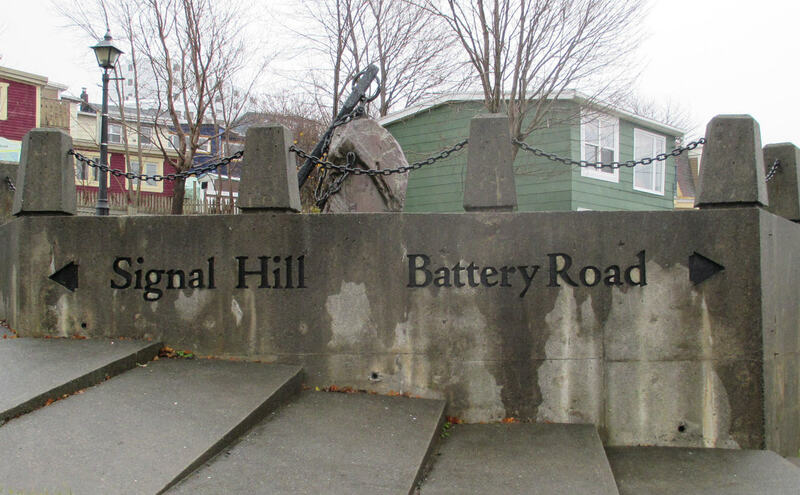 For all the glowing recommendations I’d heard, I had yet to personally enter the East Coast Trail from Battery Road, so out I went in my bright yellow anorak, giggling at how others might perceive this behaviour. 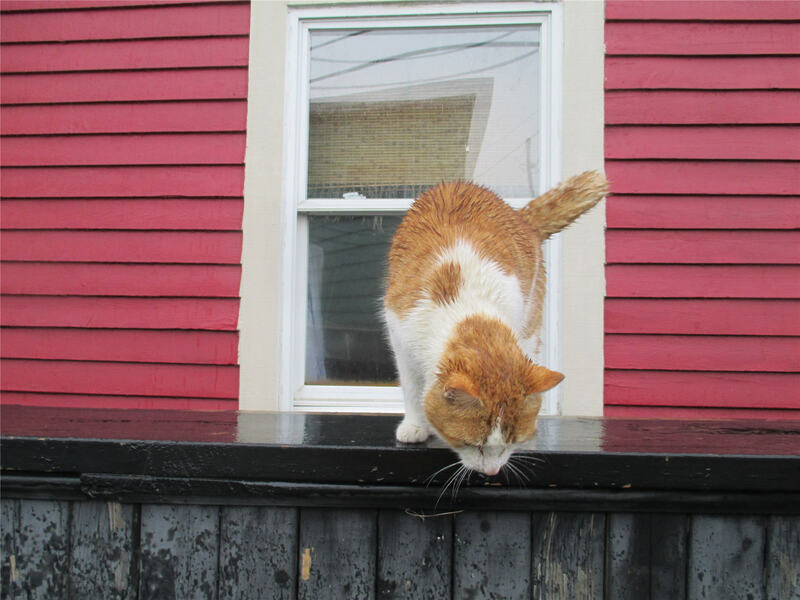 Over the space of three hours, I met exactly one cat and two other hikers, all obviously Newfoundlanders. They greeted me warmly, I think impressed that a Come From Away (with her hair stuck to her head, jeans soaked through) would choose this weather to explore the trails. Weather has never deterred me, having northern Ontario in my blood. 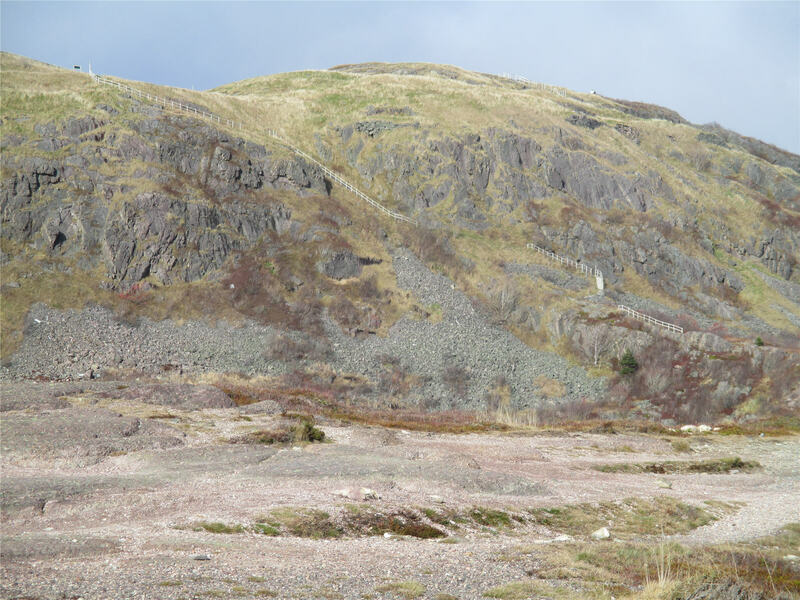 I climbed that Rock, chin out, determined to live in and on the landscape one last time. and this chain, offered to assist worried travellers, reminded me of the avalanche scene in Lord of the Rings. The trail being slick and me being new to it, I took the proffered chain gladly. Who has this kind of adventure? Well, me. As I hiked, I realized I wouldn’t wish some of my life’s experiences on my worst enemy’s meanest pet, yet I wouldn’t trade moments like this with anyone. These stairs were the best workout I’ve had in months! 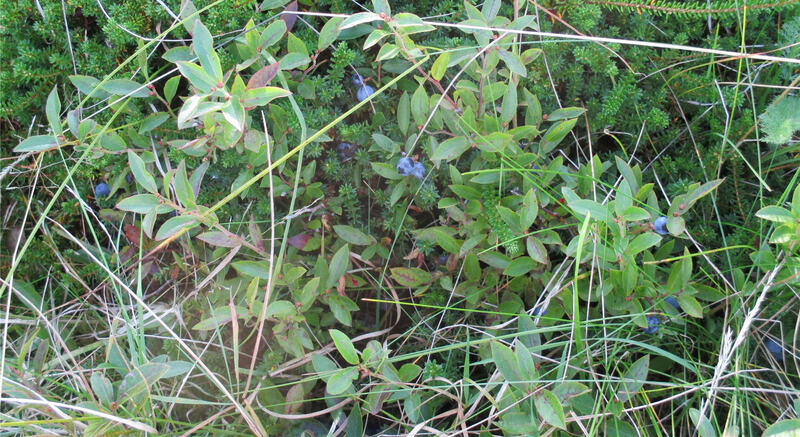 During the hike back to the city, I was overwhelmed by the expanses of blueberry and cranberry plants that grow wild alongside the trail. 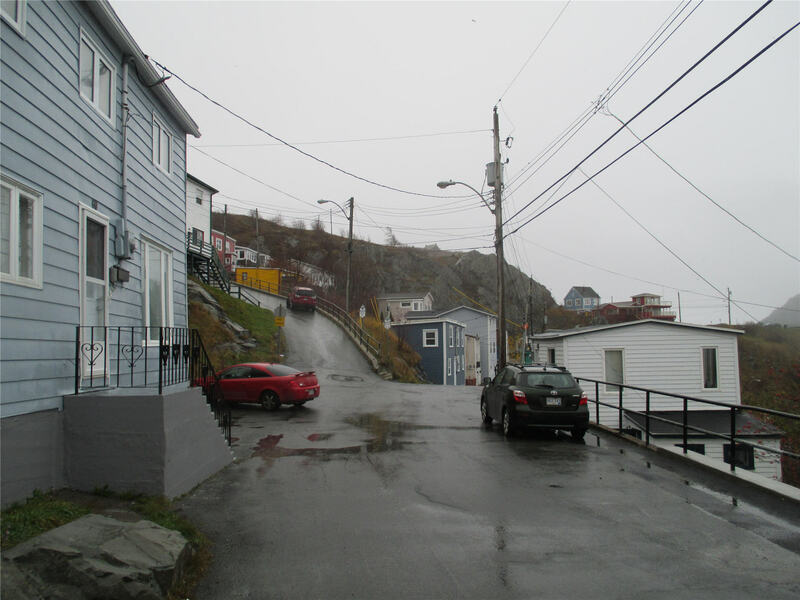 Oh, to be in Pouch Cove, hunkered by a black dog named Nina, both of our faces stained and foolish with contentment. Instead, I stopped at a solitary rose bush and ate late rosehips one last time. 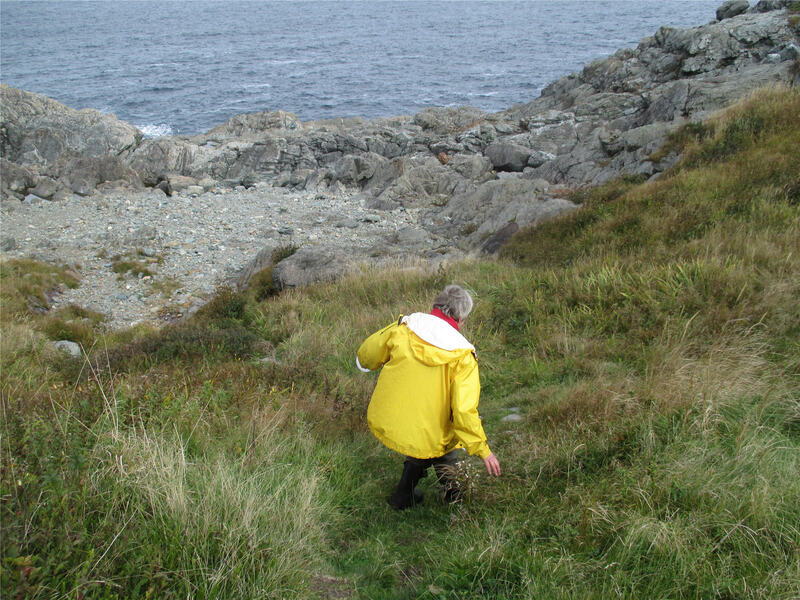 Newfoundland, you are my foraging heart’s desire. Over coffee in Kingston last night, my sister offered her loving insight. As we stood to go, my little sister hugged me tight. “I’m so glad you’re here!” she whispered. “You’ll get there. And meanwhile, you have stories to share, wherever you are. Please don’t stop writing!” she begged. This same sentiment has been emailed to me repeatedly and vigorously by others, including my very best friend, in Ottawa. *sigh* Alright universe. Get your hat: we’re going on an adventure. Crossed the deserts bare, man. Every year I make a New Year‘s resolution to experience something new. One year, I decided to challenge myself to experimenting with cooked puddings. Every month, a new recipe would be tested out. I thought I‘d tried them all, but just this October I was introduced to my all-time favourite pudding. Just goes to show you can always learn something new. My farmer is a great forager. 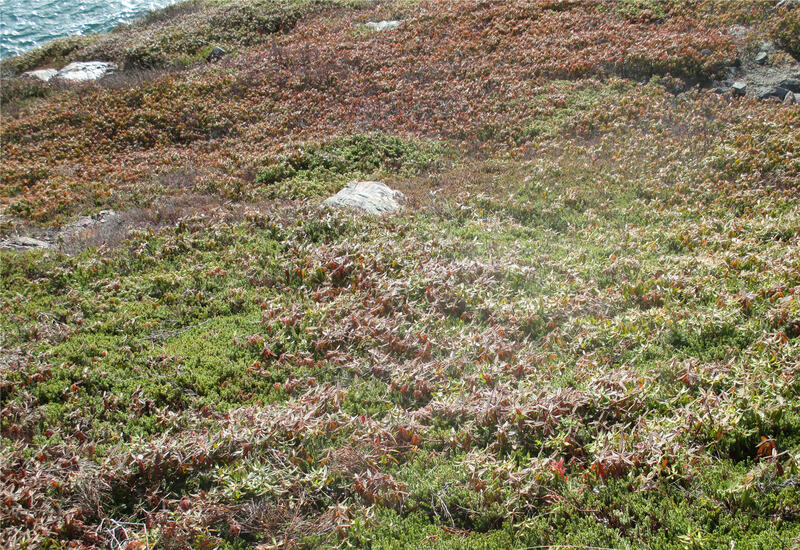 She can see potential food in nearly anything growing on the Newfoundland landscape. 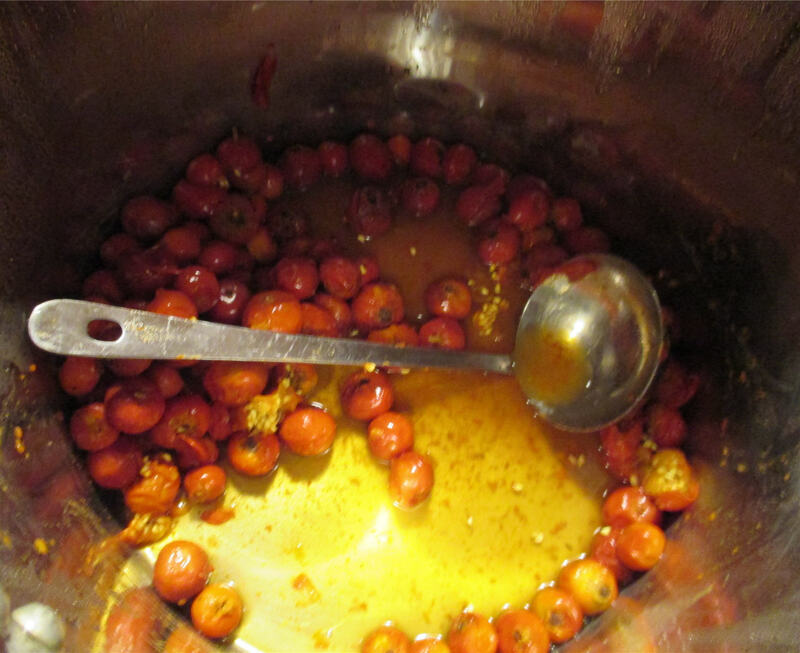 One of the things we foraged together is rosehips. A rosehip (or rose hip) is the fruit of the rose plant. It‘s typically red or bright orange, but also sometimes dark purple or even black. 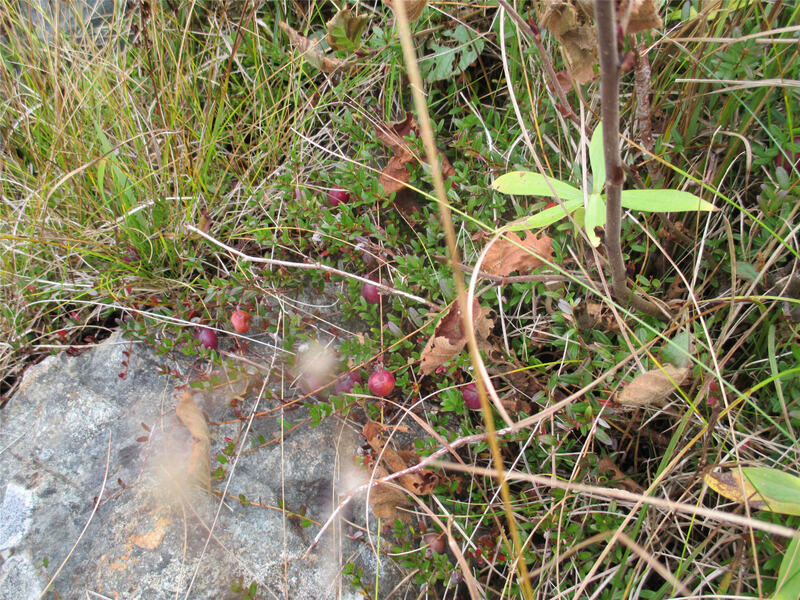 Rosehips form after flowers are pollinated in the spring and they ripen in late summer and autumn. 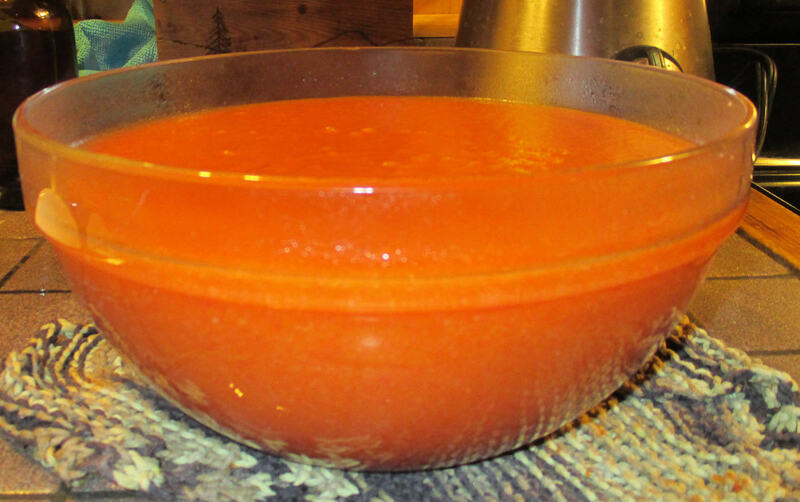 Rosehips are used in lots of foods—jams and jellies, syrups, soups, pies and breads, teas and even wine. 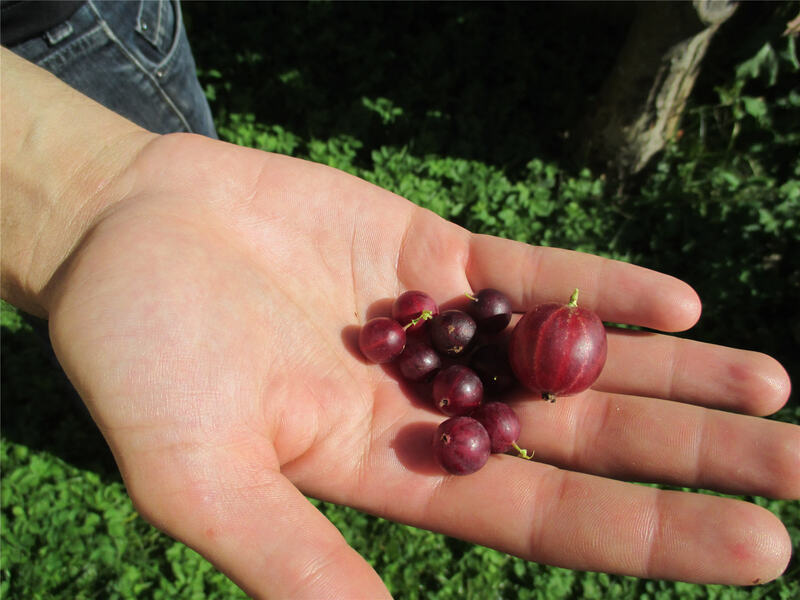 You can eat them raw, like a berry, if you can avoid the hairs and hard seeds inside the fruit. Rosehips are one of the richest plant sources available for vitamin C, so every good forager should be greedily protecting their rose bushes at this time of year. My farmer has friends who travel out of province for the winter. Their rose bushes would be the envy of any alert forager. 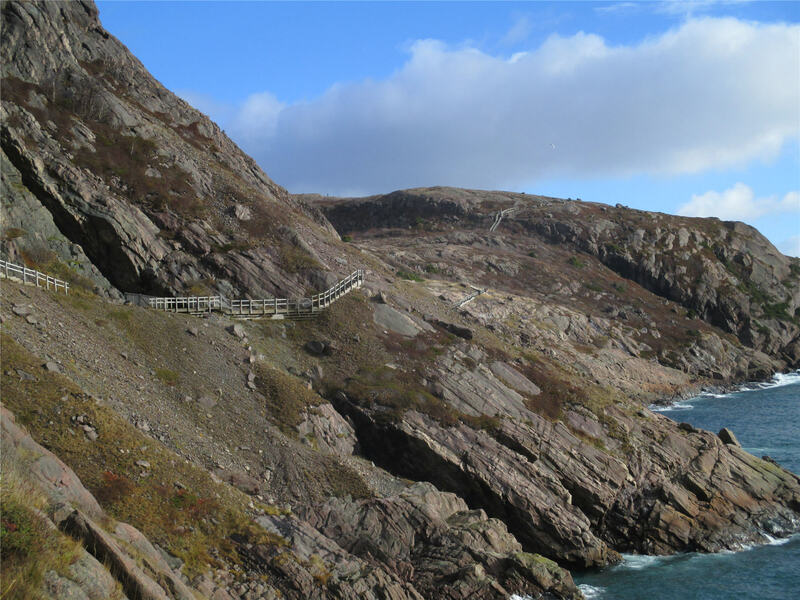 The friends live in Red Head, another of those breathtakingly beautiful coves along the Avalon Peninsula in Newfoundland. 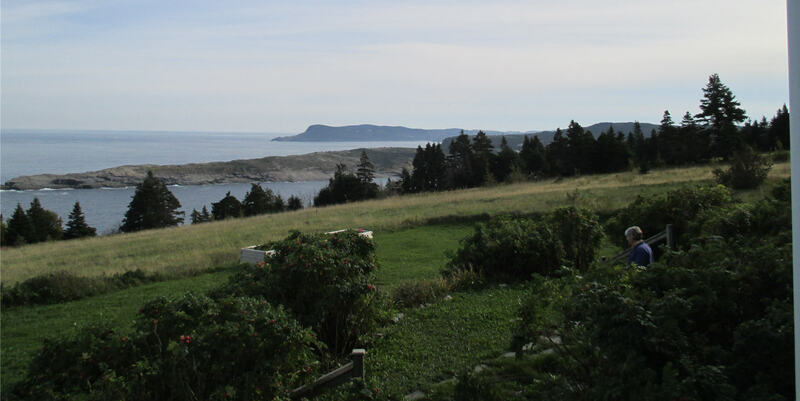 Their back yard looks out over a long pasture which ends at a wooded area, through which the lovely East Coast Trail meanders beside the Atlantic Ocean. And in this back yard grow those wondrous rose bushes. There were at least a dozen enormous plants growing here, the hips bright and luscious, the thorny branches sagging with an unexpected harvest. We picked quietly for an hour, the farmer, my friend Thomas and I. Some of the fruit was overripe and therefore mushy and dark. Some of it was underripe and refused to come off the branches at all. 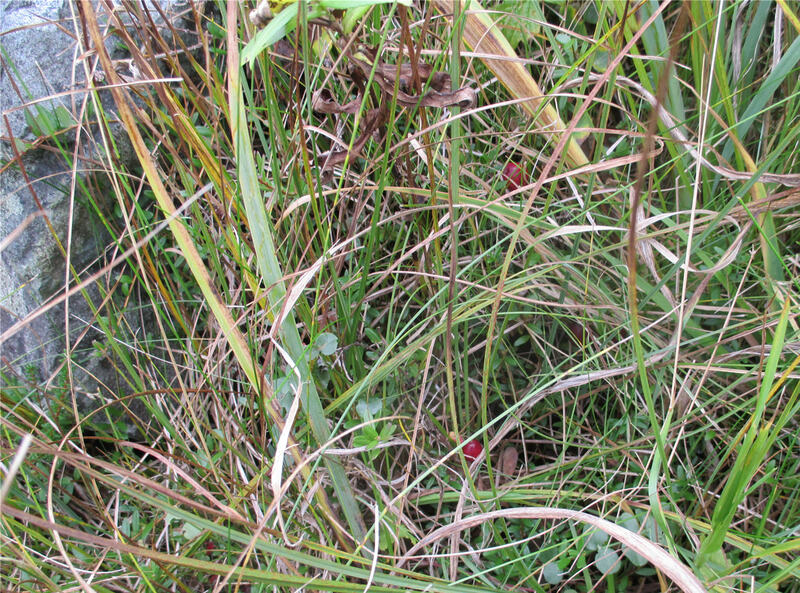 Of those hips that were ripe, the berries with their serrated-edged leaves on the bottom (causing some concern to the uninitiated) came off relatively easily, oft-times leaving an opening at the top, from which one or more earwigs would sometimes apologetically emerge and scurry away. Thomas and I were doubtful of this bounty that the farmer was clearly relishing, her thoughts racing ahead to a miraculous pudding. Back at the farm, the farmer took Thomas and me to the side garden, where we picked a small bowl of crab apples to add to the pudding. These too looked dubious just off the tree with their bruises and ridiculous tininess. Who actually eats crab apples, I wondered. Our first duty in the kitchen was to clean the fruit. All leaves and stems were removed, all insects were escorted out the door. 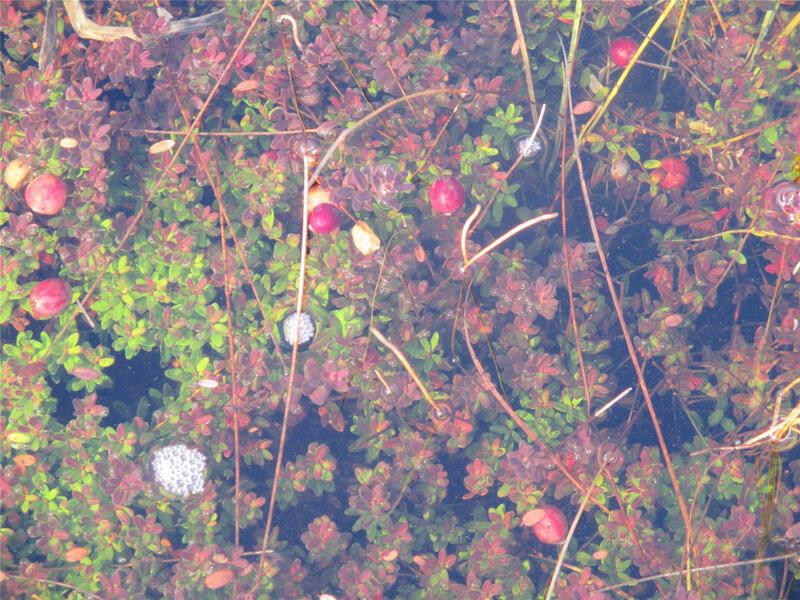 Then, pots of crab apples and rosehips were set to boil in a bit of water on the stove. Once cooked through, both fruits were very soft and the various elements—skin, flesh and seeds—separated easily. That was the moment our farmer presented us with the most magical kitchen tool ever, a chinois. A chinois is a funnel, in this case metal, and the holes are big enough to let fruit flesh through to a waiting pan while holding the seeds and skin back. After only a little pressing, the result inside the chinois is an unbelievable mess of seeds, pasted together with a little cooked rosehip (or later, crab apple) skin. 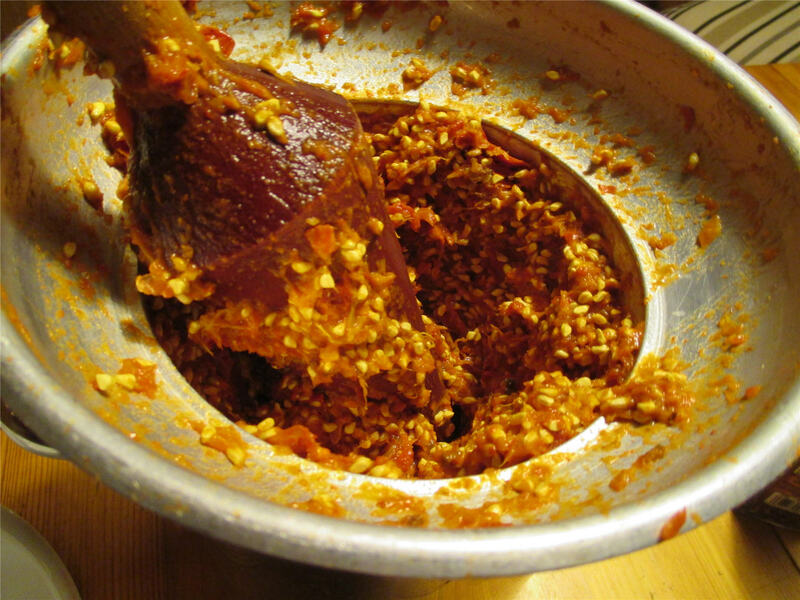 You use a large wooden pestle to press the fruit against the sides, forcing the flesh, or mash, out. 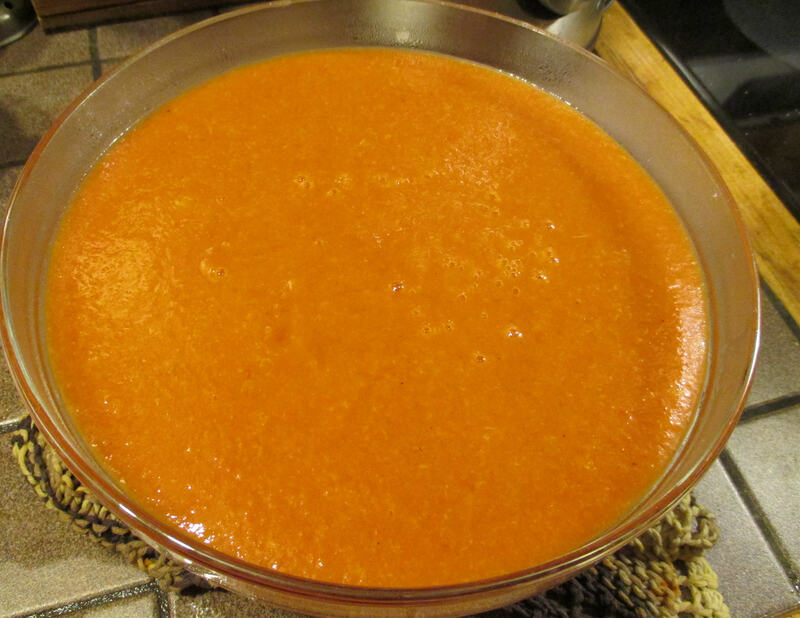 the crab apple pudding comes out a much deeper, reddish hue. 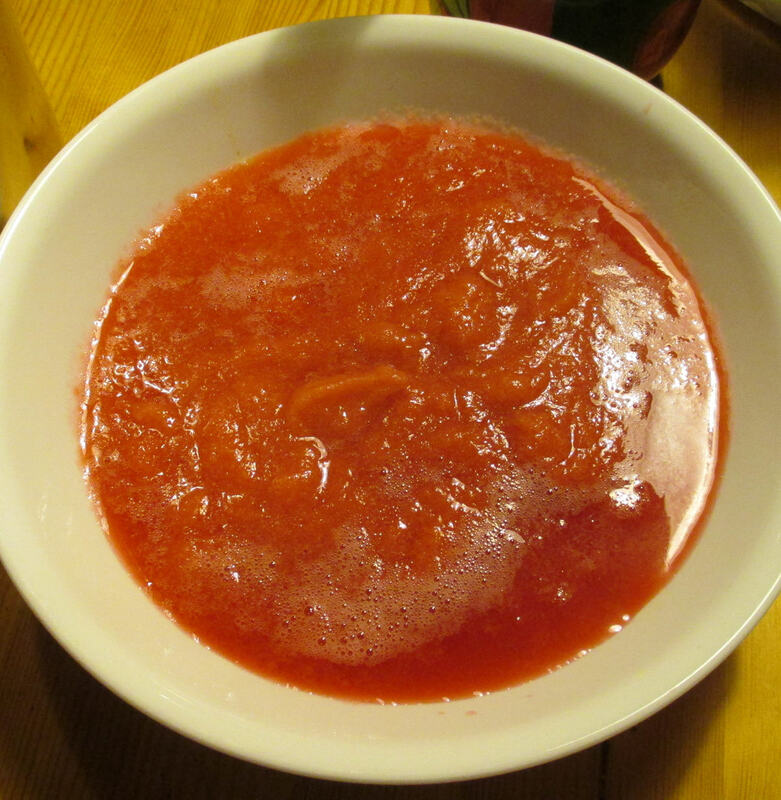 and combined, crab apples and rosehips, with just a touch of sweetener, make the best pudding known to man. And I should know: I tried them all one year, as a New Year’s Resolution. Every kind of pudding I tried, except rosehip-crab apple pudding, now my favourite. 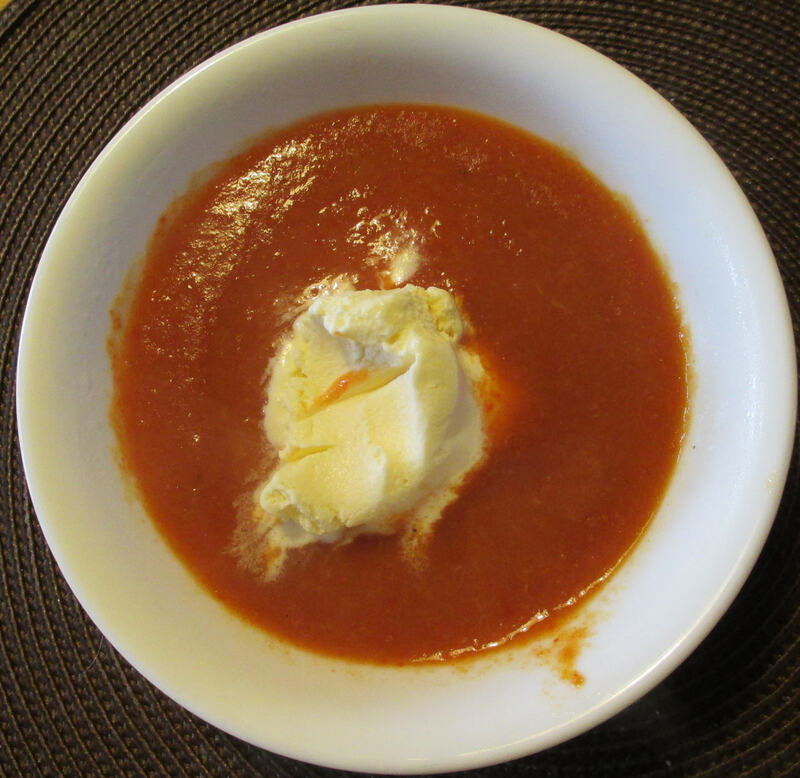 Heat the pudding and serve with a dollop of vanilla ice cream. Heaven ensues. “Would you take the dog for a walk, please?” my farmer asked, hoping to encourage me out of myself for a couple of hours. Not having slept well for two nights, I wasn’t really in the mood to face the overcast day or the chilling winds, but I had no excuse. The dog needed no further urging. She was already at the door, her tail signalling enthusiasm for the proposed outing. 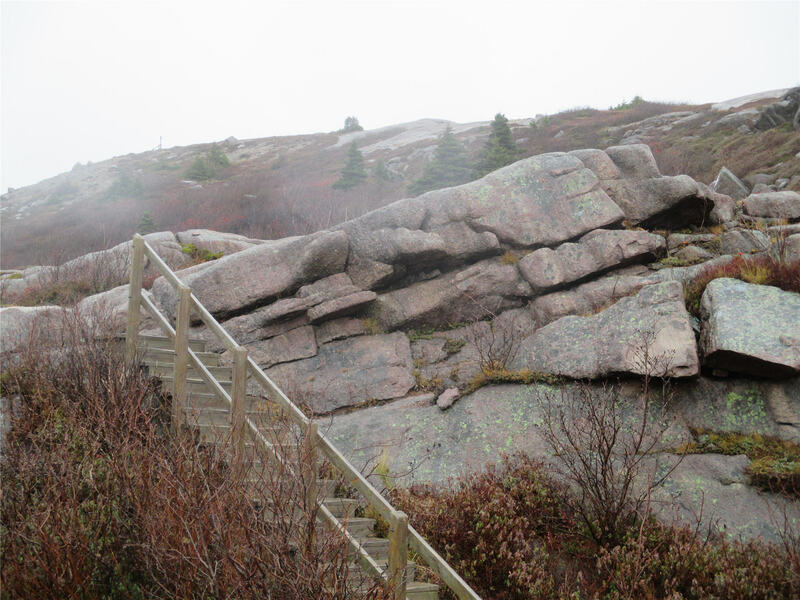 The entrance to the Shoe Cove trail, at the Pouch Cove end, faces the ocean. 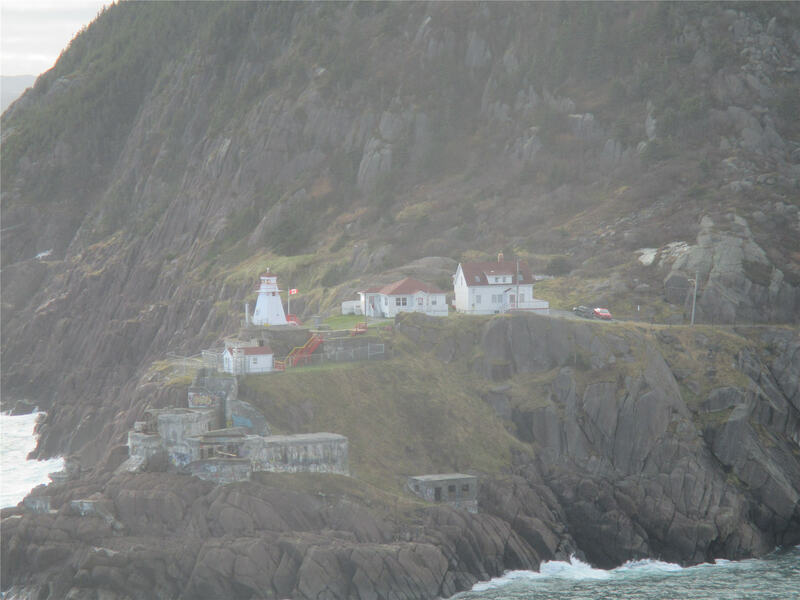 Today, waves crash against the rocky shoreline. A few scattered snowflakes are frozen on the muddy trail. Nina and I enter the trail slightly intimidated by the weather, which has a sinister feel to it this time. 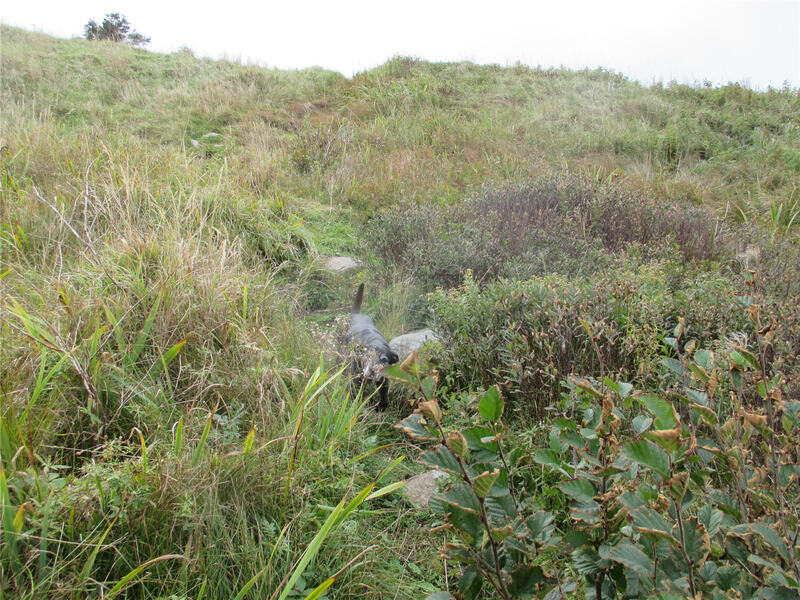 On our left, a sheer descent is at times only a metre from where we tread, and because we’ve had rain in recent days, there are many streams racing across the trail and down the cliff side, making our footing treacherous. 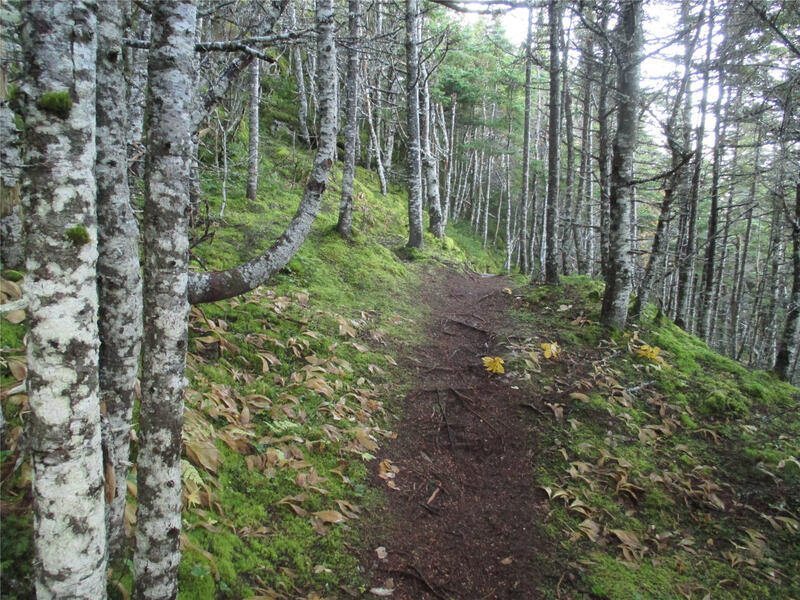 Nina runs ahead once we get into the overgrowth, fragrant with cedar, larch and balsam, and bright with a lush mossy carpet everywhere. I too relax, remove my gloves and hat, and unzip my jacket. The wind is blocked behind the scrub brush and the sound of the waves is muted. My steps slow down now that the dog is off leash, and my mind wanders back to the previous evening. After dinner, my farmer had asked me something startling. “My runes?” I said, unsure whether I’d heard this normally unsentimental woman correctly. Runes are the letters that pre-date the Latin alphabet for Germanic languages. They’ve been retained for specialized purposes in various cultures, including divination. It felt too hocus-pocus for me, but I could hardly tell her ‘No’. Putting a dark, cloth bag on the table, she directed me to pull three stones from it. 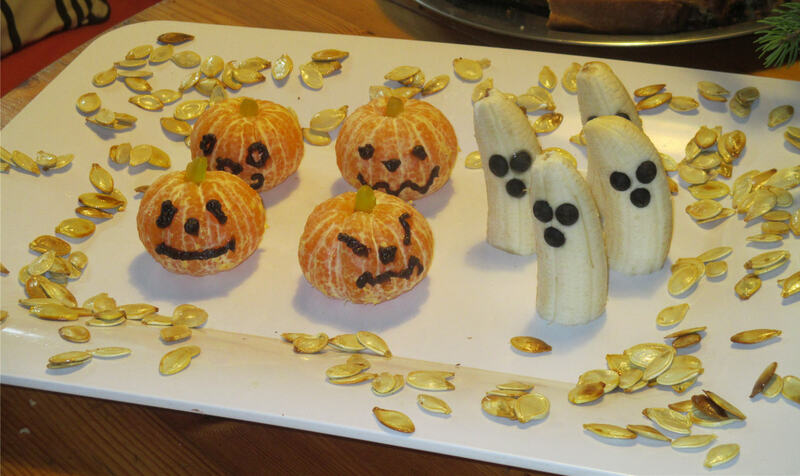 I was careful to place them in order of selection, on the table. I had selected Laguz, Ing and Isa. My first rune, Laguz, literally means water or lake. The Atlantic Ocean, I thought. What I’ve been staring at out my bedroom window for a month. That’s interesting! Ing or the God Ingwaz means something almost always positive. My final rune, Isa, represents ice. Back on the trail, Nina was by my side, patiently hoping for a biscuit. Optimistically, she sat in front of me, her eyes watching my hand. Because we had stopped, I took a moment to look around us, more aware of our surroundings suddenly. Nina broke her biscuit apart and stooped to collect the first half. On the path beside her biscuit was a black feather. 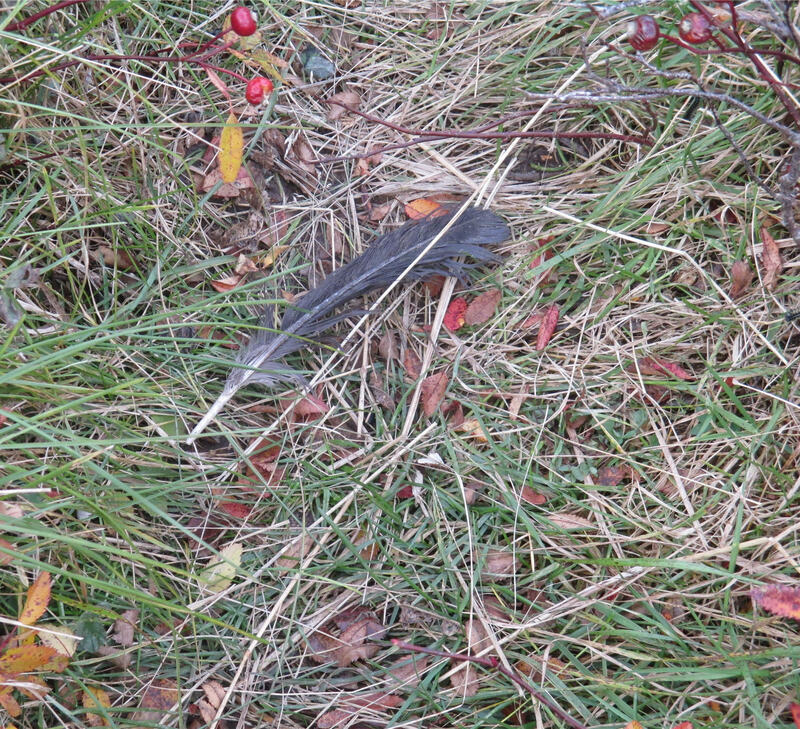 Picking it up, I realized this was no crow’s feather. It was a larger bird, like a seagull maybe, but black. A raven. 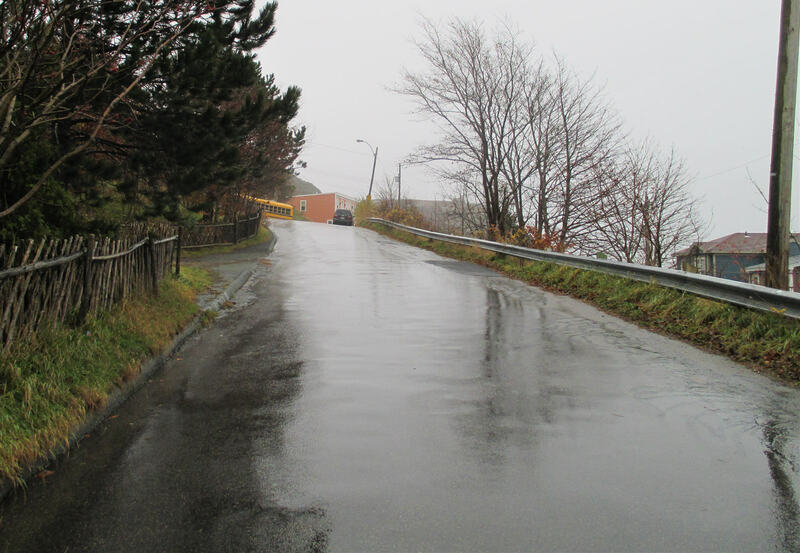 Two weeks ago, I was experiencing some uncertainty about my role in Pouch Cove. 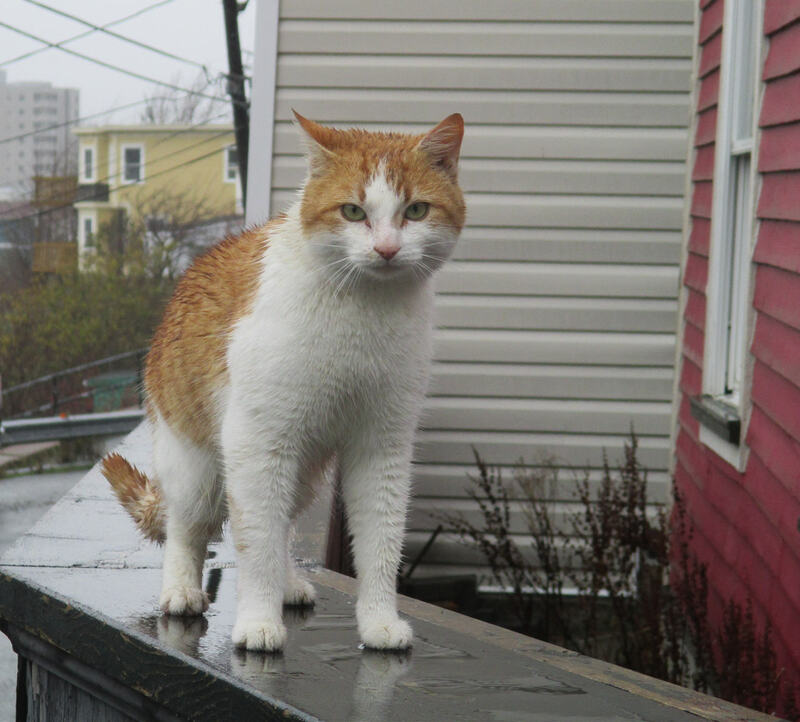 Our neighbour Dan had sensed my concerns and invited me to his deck for a coffee. He suggested I lean back and close my eyes, and then walked me through a visualization exercise. “Imagine everything you want in your future, to as fine a detail as you can,” he suggested. I’m terribly pragmatic by nature. Still, I like Dan and wanted to please him, so I did as I was told. I imagined living in a neat little wooden structure by the sea, with a cat and some chickens, a totem pole in the yard, some good friends and even a long-term companion. It was a pretty picture. Not very likely, but pretty nonetheless. I opened my eyes feeling some satisfaction just as a bird called above us. A large, black bird, circling and calling assurances. 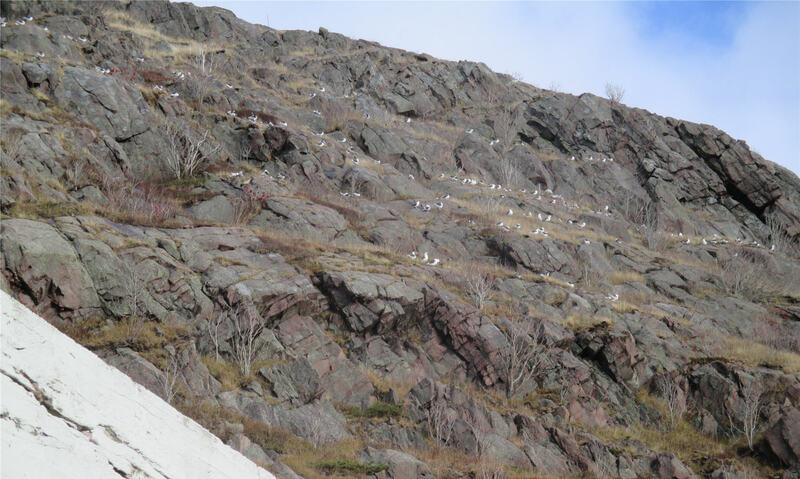 We get ravens here in Pouch Cove. It hardly seems possible, but I’ve seen them, and so have the neighbours. Our neighbour two doors down stopped me one day to tell me that he’d watched a raven make off with one of our baby chicks in its beak. I wasn’t sure whether I could become fond of such barbaric creatures. My farmer was more circumspect. 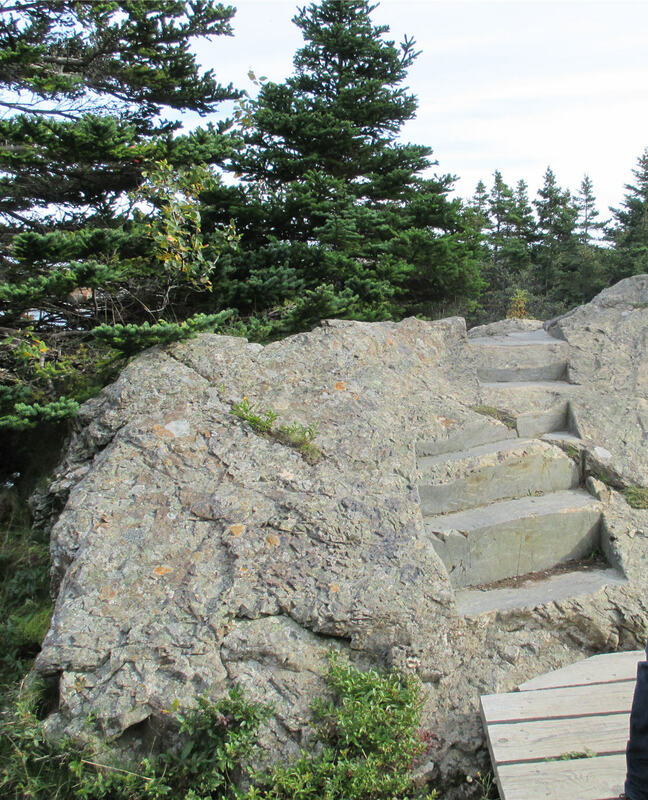 Nina and I continue our hike as I ponder all these moments from my time in Pouch Cove. Only a month here, yet it seems so much longer. I’ve learned to tend chickens, but also goats. 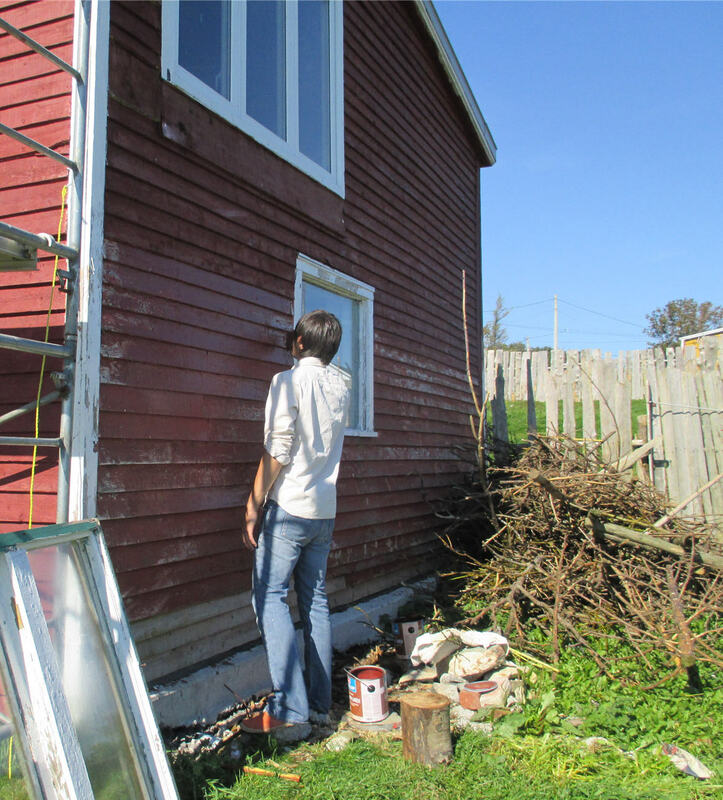 I’ve painted an entire barn, and then mucked it out. I’ve assisted with the Bed and Breakfast, and done lots of entertaining. 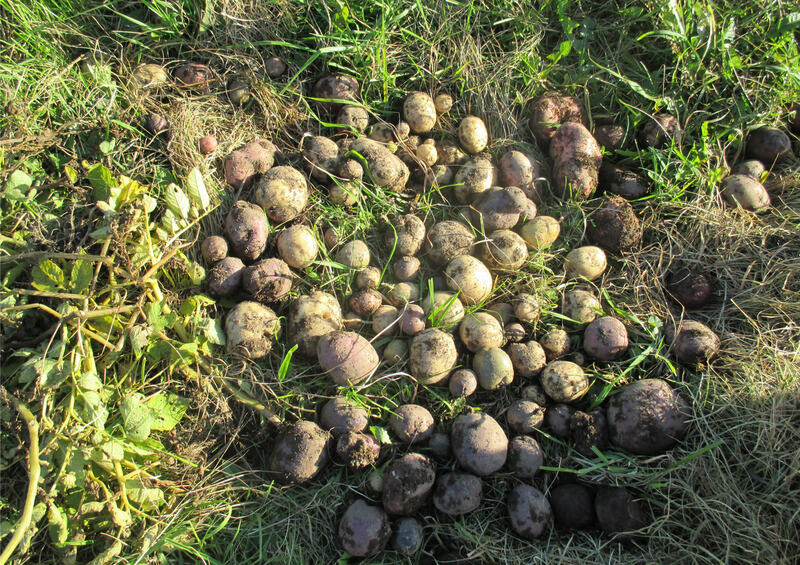 I’ve harvested three kinds of potatoes, including the lovely blue heritage variety. And I’ve foraged for mushrooms and rosehips and more types of berries than you can shake a stick at, as they say. 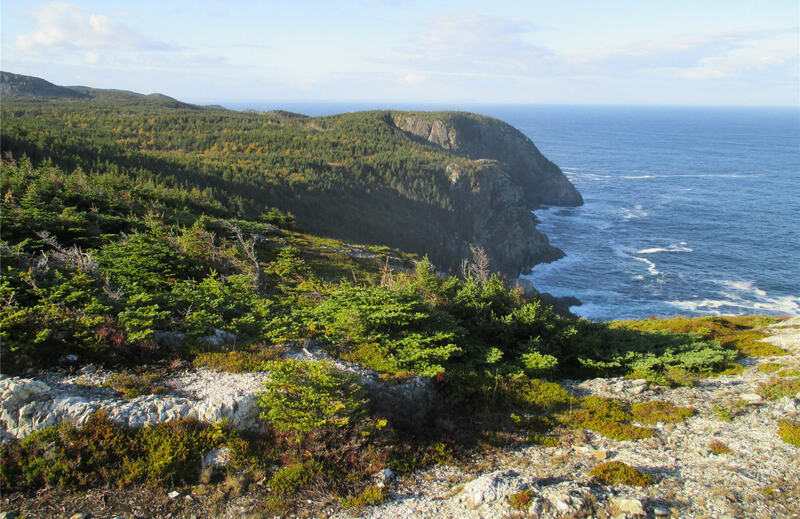 and I can’t imagine a week without a hike along the East Coast Trail. It’s been a busy, productive month, but not without its worries. 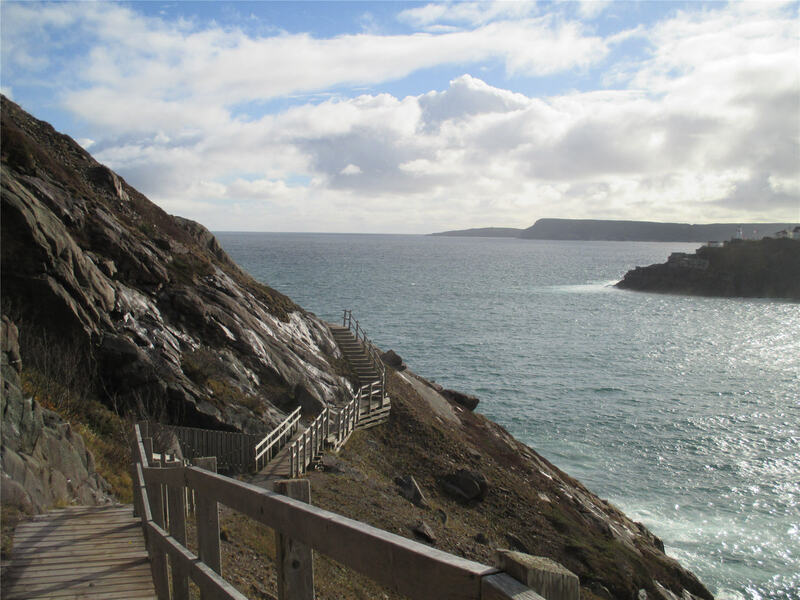 We come to the path that leads down into Shoe Cove, a sheltered area where the wind is blowing the waves madly against the walls, foam spraying up far above our heads. Nina scoots down the embankment ahead of me and disappears into the woods on the other side. We’ve reached our destination, so to celebrate this small victory, I sit on a large rock to watch the waves come in and to ponder again my future plans. What should I do? Should I stay and try to contribute to the community? “uuuuUUCCGGG,” something screams above me. I look up. Two ravens are circling above the cove. “uuuuUUCCGGG,” the other bird screams in response. I’ve never seen a raven before: I wonder why there are so many raven portents in Newfoundland. Standing up, I realize time is passing; the farmer has asked me to be back by 4 p.m. to assist with Hallowe’en. Tonight is a time set apart for spiritual journeys. 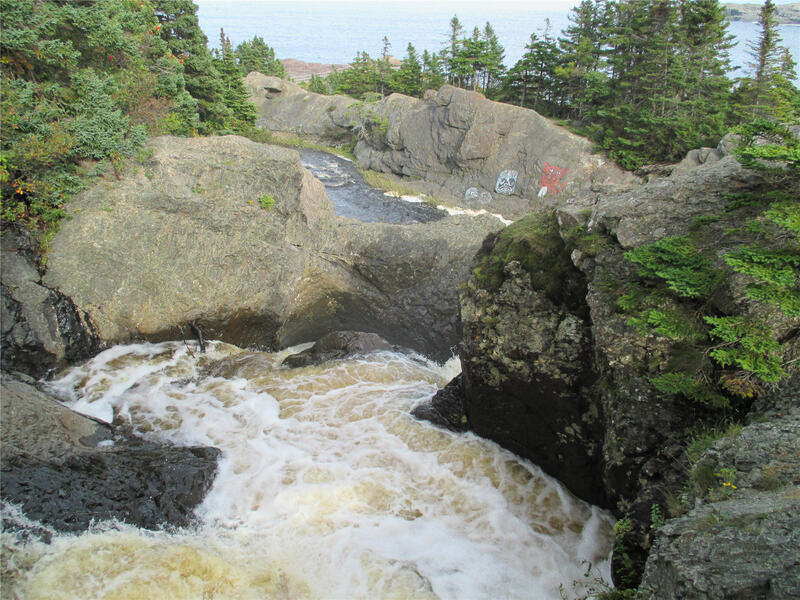 Perhaps also for spirit guides, like ravens who’ve witnessed many of my Pouch Cove doings. “uuuuUUCCGGG,” says the raven again, a final salutation before they disappear out of the cove. I’ve come through the first month affected deeply by the magic of the landscape and the ocean view, moved by the warmth and honesty of the people and embraced into a community that wants to include me in some excellent projects. Even better, I feel completely accepted by a very agreeable band of madcap animals who take turns lying on my bed uninvited, chirping and purring in my ear, baaing for handouts and growling for walks. My chores are punctuated by head noogies and bum rubs, raspberries into cat bellies and clucking noises into a one-legged chicken’s feathers. Suddenly, my mind is made up. Heaven spots are pieces that are painted in hard-to-reach places such as rooftops and freeway signs, thus making them hard to remove. Such pieces, by the nature of the spot, often pose dangerous challenges to execute, but may increase an artist’s notoriety. This term also encompasses a double-meaning as the locations are often very dangerous to paint there and it may lead to death, thus, going to heaven (also known as “hitting up the heavens”). As Thomas and I followed Elke along the coastline this afternoon, and listened to her description of the foraging activity she had planned for us, I was reminded of these graffiti artists. I wondered momentarily whether Elke had tired of our services. 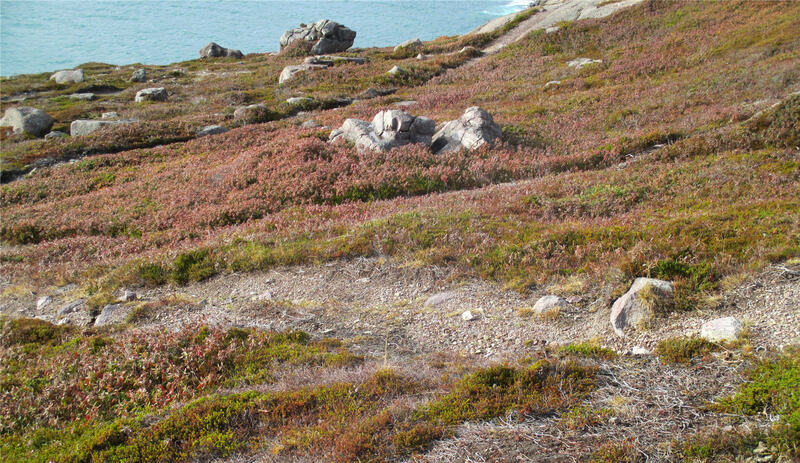 You see, we were collecting Newfoundland cranberries today, and cranberries only grow in remote, hard-to-reach locations. 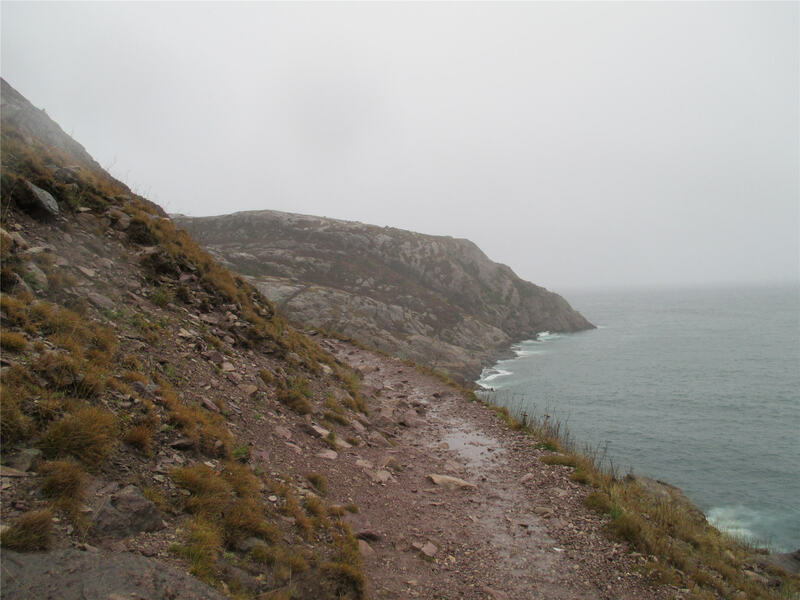 “They only grow along the cliffs where it’s wet,” she explained as she descended a narrow, muddy trail that led down the side of the coastline. 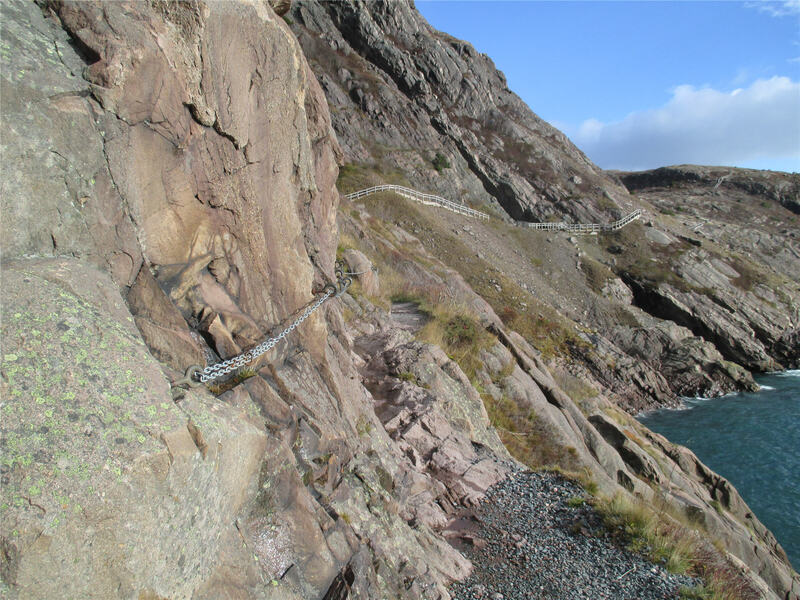 Just the descent was treacherous. There are no trees or shrubs to cling to, so you’re left with grasping any nearby grasses and praying they’re well anchored. As with all the foraging exploits we’ve been on so far, I began this one full of doubt but reliant on Elke, whose experience in all things foraging surpasses my craziest notions. “They grow underneath, so you have to uncover them,” Elke told us. Halfway down the trail, Elke pointed. “Here,” she directed me. “Here are some berries. You see them?” And with that, she wandered off to another part of the coastline, leaving me to my own devices. I leaned tentatively to where she pointed. 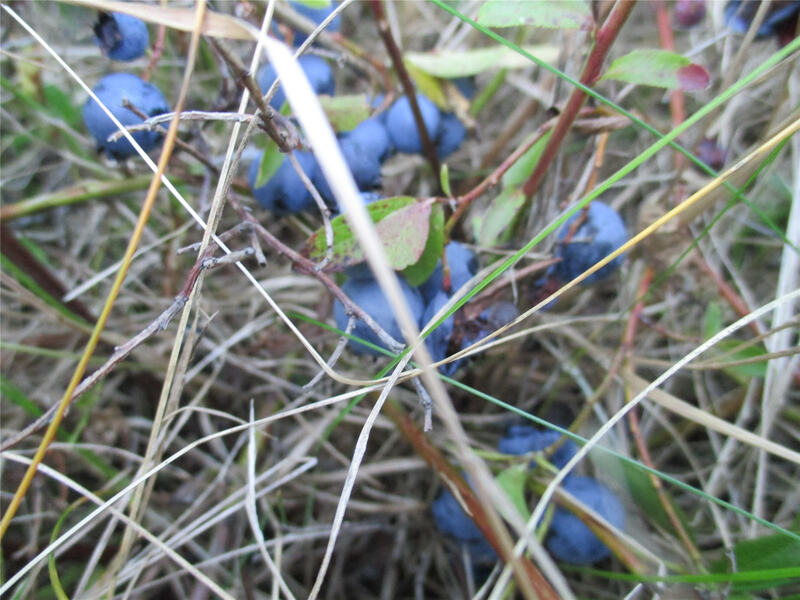 Seeing the berries, I suddenly realized I had tufts of long grass clasped firmly in one hand and a large plastic container tucked under my other arm. Picking cranberries with both hands occupied and my body clinging precariously to a nearly vertical descent was the next mystery I had to untangle. However, I knew that cranberries are one of my very favourite fruits, and I’m a pretty determined gal. How others manage this feat, I don’t know. 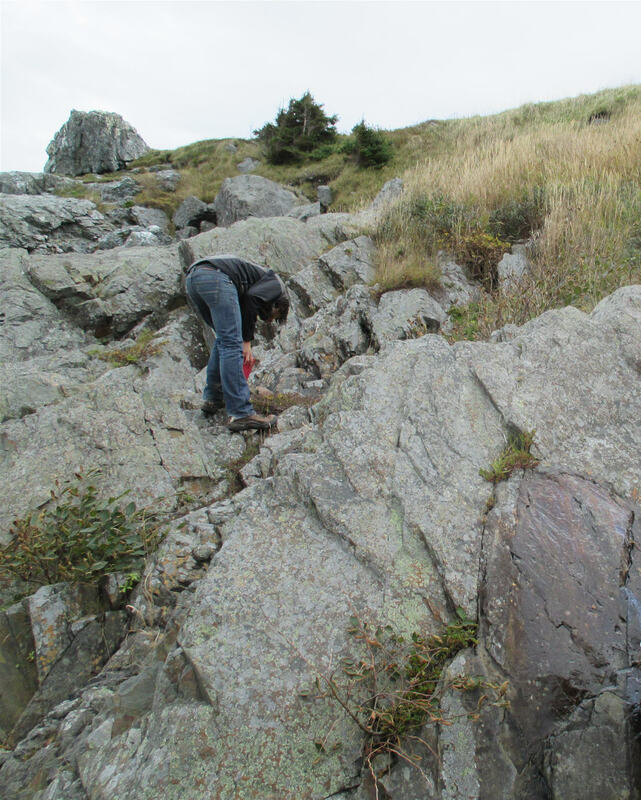 Thomas got the hang of it before I did, but for me it meant setting the plastic tub down in a rocky nook nearby, planting both feet against solid rock and keeping my centre of gravity low. The first five minutes were apprehensive, but I overcame that quickly when I realized how plentiful, how tart, and just how magical these cranberries were. They looked exactly like the cranberries I’ve been buying in plastic bags at the supermarket all these years! 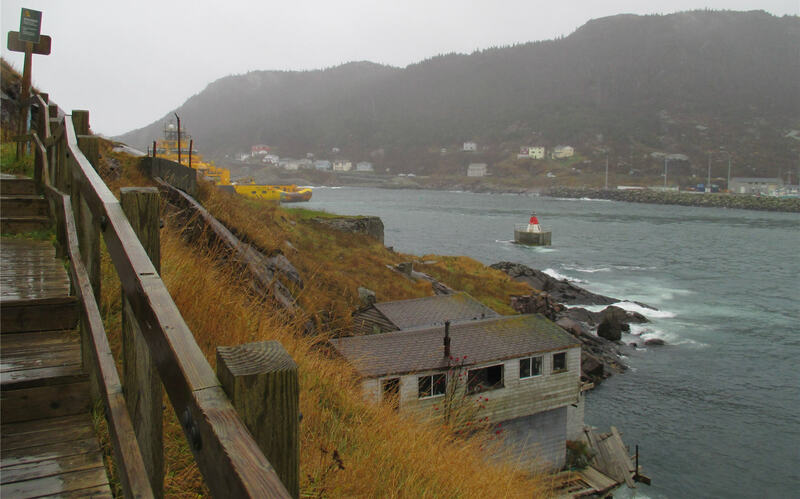 “We look like typical Newfoundlanders,” Elke commented on the way home. “Almost everyone around here goes out with a container on the weekend and collects berries,” she mused. With that comment my foraging heart felt terribly at home, even though the adventure involved a little of the old “risking life and limb” to accomplish our ends. 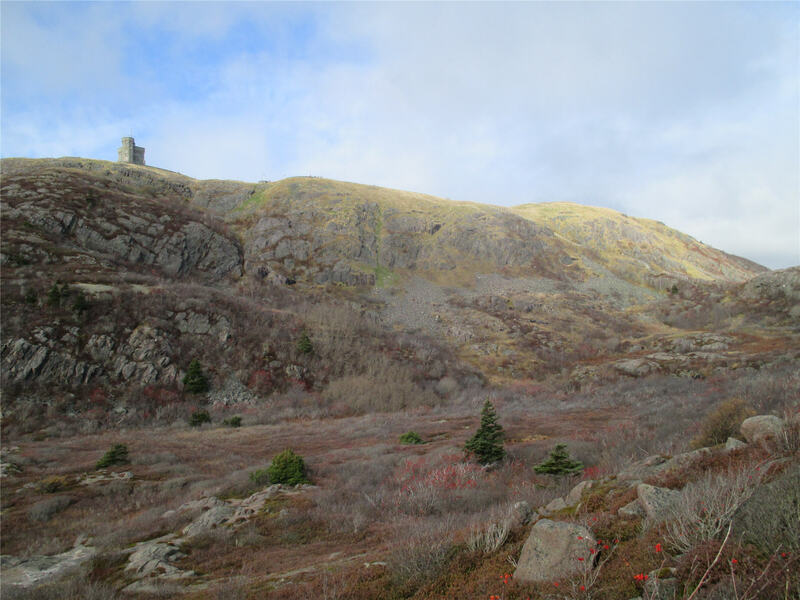 We’d walked two minutes from the farm house, descended the magnificent but incredibly unforgiving cliff face, and foraged a most welcome Thanksgiving treat. ah, Cranberry and Orange Loaf! Mix dry ingredients together. 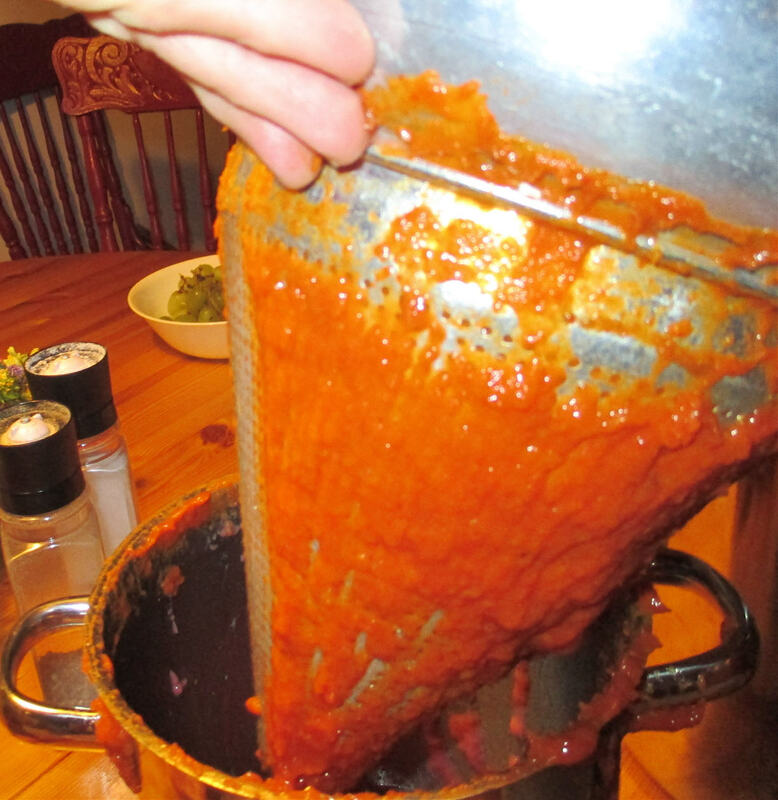 Mix wet ingredients separately, then add to dry ingredients. Bake 45 – 50 minutes at 350 degrees. On Monday morning, I officially began work as a WWOOFer at Points East. My duties for the next two days were not arduous and I really love learning. Almost everything I was tasked with was either outdoors or in the kitchen, so I was delighted. 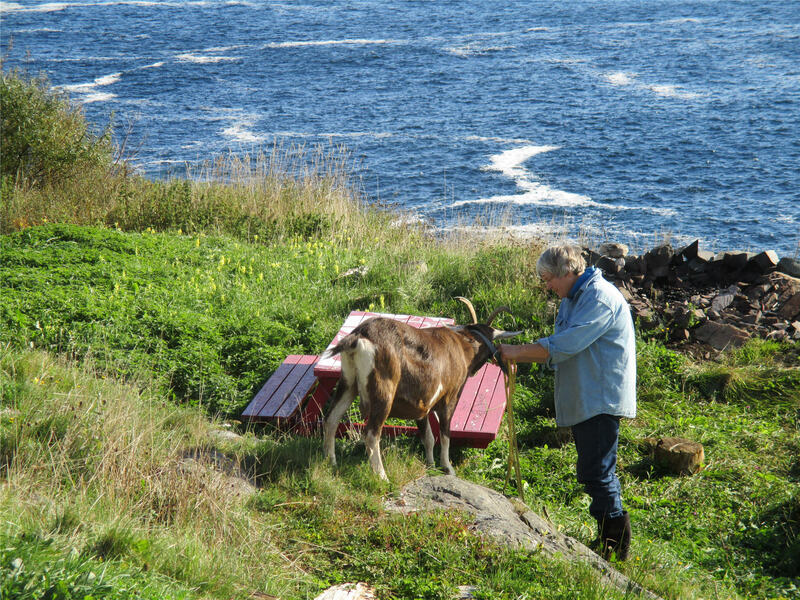 Before anything else on Monday morning, we moved the goats from the barnyard to a pasture area, where they could forage on wild grasses all day long. 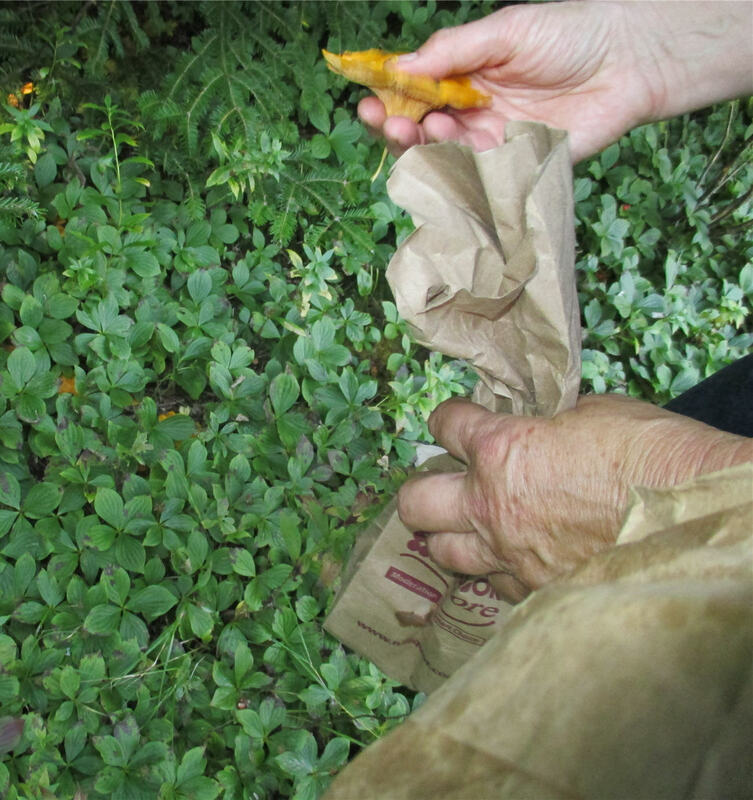 The only thing goats can’t eat is goldenrod, so I removed any of that within reach before we tied the goats up. These goats are very friendly, and because the neighbours come to feed them scraps often, they’re used to having their heads scratched. 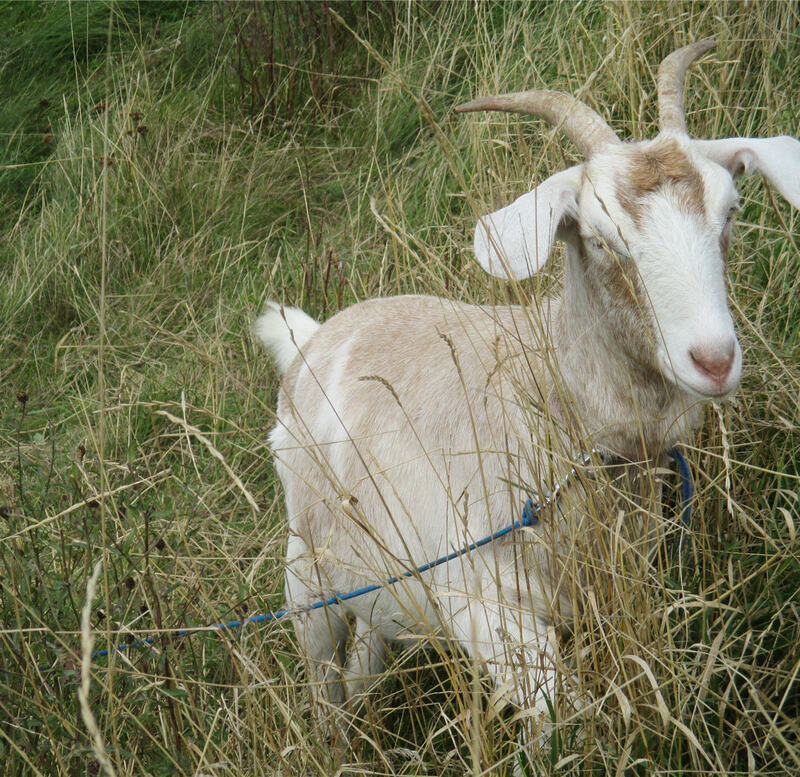 Female goat personality is interesting. They’re insecure animals, and like to travel as a pack. When you approach the barnyard, they back away immediately. Elke takes a cup of food with her to attract them. Then, we worked as a team: Elke harnessed Jenny, Thomas took Alice and I took Jill. As one, we led the goats down to the grazing area. They drag you urgently ahead, as if there’s a fire behind them, once they understand where they’re headed. Goats are also suspicious of anything new: because we later left our ladders against the barn in their yard, the goats refused to enter the gate at the end of the day. They raced to the gate even more urgently in the evening, and then halted dead when they saw the ladders. 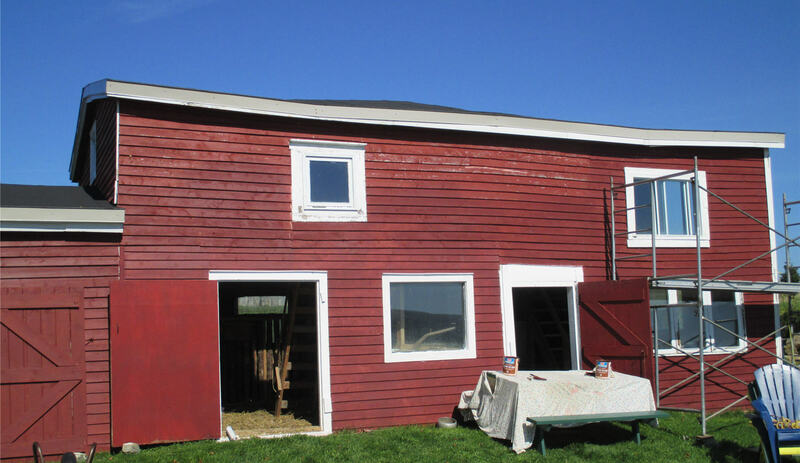 With the goats out of the barnyard, Thomas and I pulled out paint cans and brushes and proceeded to paint the barn red. We could see immediate results from our work, which made us both giddy. The forecast for the Monday – Tuesday was clear skies, so we painted like madmen. I even climbed the ladder and did the west-facing wall while standing on the roof. There is something honest and true in manual labour, especially when performed on something as conspicuous and accepted on any country landscape as a barn. After lunch, I followed a trail north from our farm that wound through wild roses, pine trees and the biggest patch of wild blueberries I’ve ever seen. Behind me was the ocean. I’ve promised Thomas and Elke a blueberry pie. Once home with this treasure, I hurried to a small community garden that Elke has begun with the neighbours. Her own plot has been a little neglected with many summer visitors, so I agreed to harvest some kale for pesto. Most of the larger leaves are already half-eaten, so I cut those off and threw them into the barnyard for the chickens and goats. Then, the smaller leaves came home with me. These leaves, blended with oil, walnuts, fresh garlic and parmesan cheese was still very bitter. Thomas tasted it and agreed it needed something, so I added some honey. His face lit up reassuringly when I handed him the second spoonful. Just before dinner, Elke herded us all into the car and drove us to a quiet trail on the edge of town. Hiking for ten minutes took us under a stand of fir trees in a bed of moss. 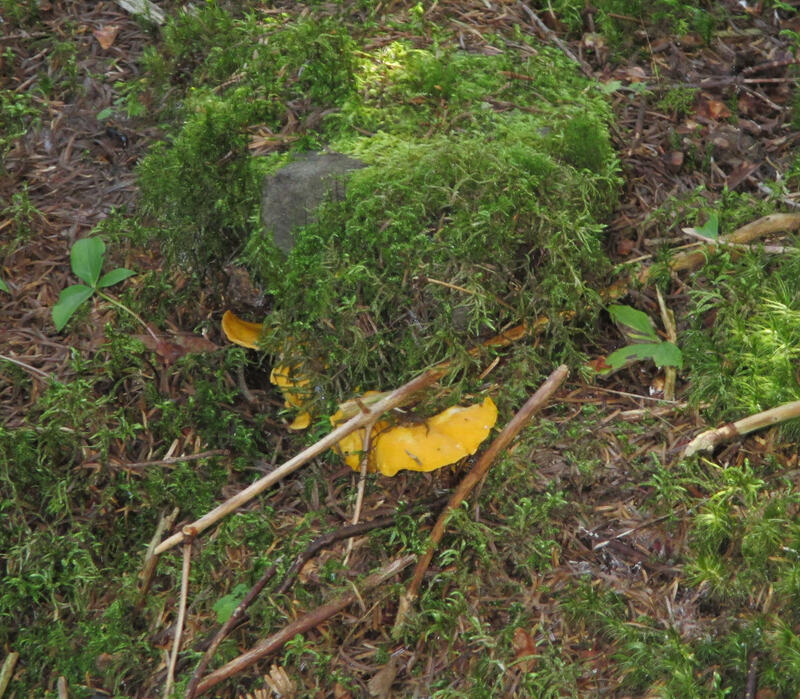 Rolling stones may not gather moss, but I assure you that moss under fir trees often gathers chanterelle mushrooms. These were plentiful and our arrival was perfectly timed for gathering one of the tastiest meals I’ve ever foraged. Now I can honestly say I’ve gone mushrooming. 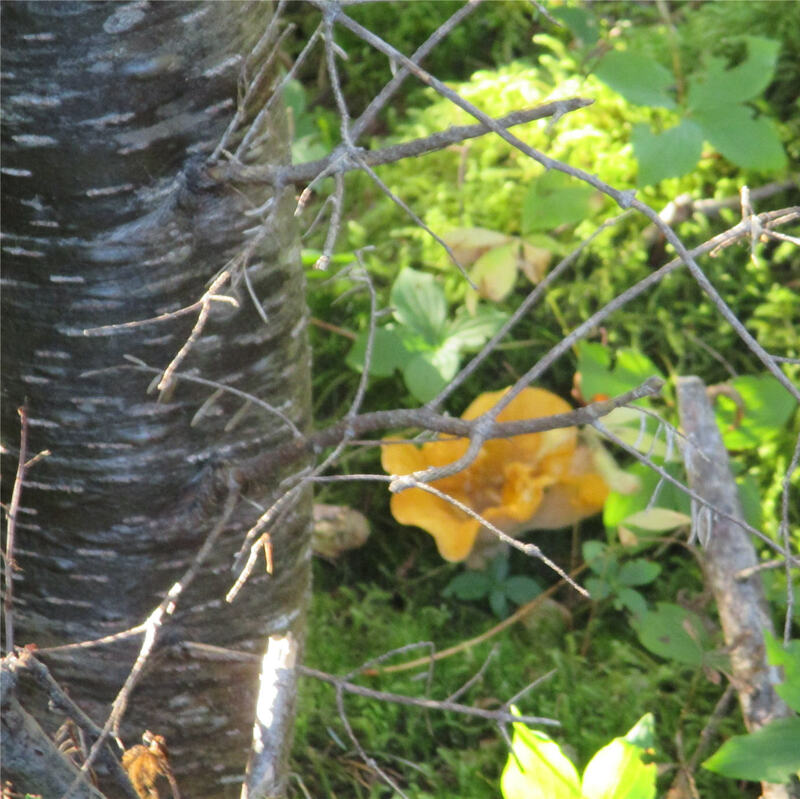 Elke pointed out several poisonous varieties, but the chanterelles are quite distinctive. This experience made me relatively confident of my new-found abilities. Yay! Elke cooked them with onion and a little broth, and laid them on a bed of quinoa. 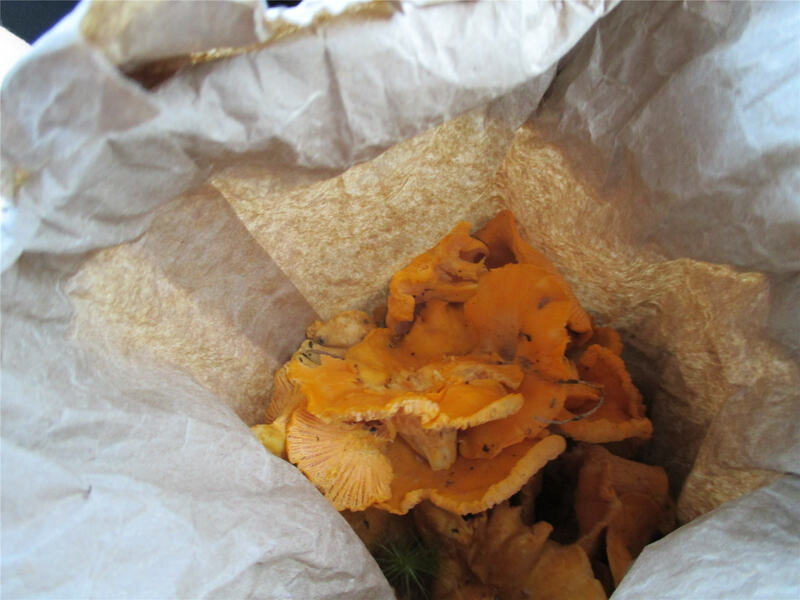 Chanterelles rule. On Monday evening, I was joined by Montana the tabby cat for a few moments of warm company on my bed. Nina the dog slept on the couch downstairs, awaiting more adventures. The stars out my window were exhilarating, but not enough to keep me awake after all that work. Tuesday morning, Thomas and I slopped out the barn. While this wasn’t our favourite duty, we both saw the need for it. Elke has it done every couple of months, apart from in the dead of winter. She lays down sawdust and then hay, which slowly mix with the chicken and goat manure to make a thick and rather coarse carpet. I teased Thomas that we were in the wrong line of business, that we should start a business selling environmentally friendly carpet, marketing it as cheap but durable (it was almost impossible to break up, even with a shovel), has a pleasant countryside odour (until you break it up, and then the ammonia smell is overpowering), and can be added to your compost pile in the spring (which was where we hauled several wheelbarrows full of it). It seemed like a brilliant business plan to me, but Thomas was less enthusiastic. 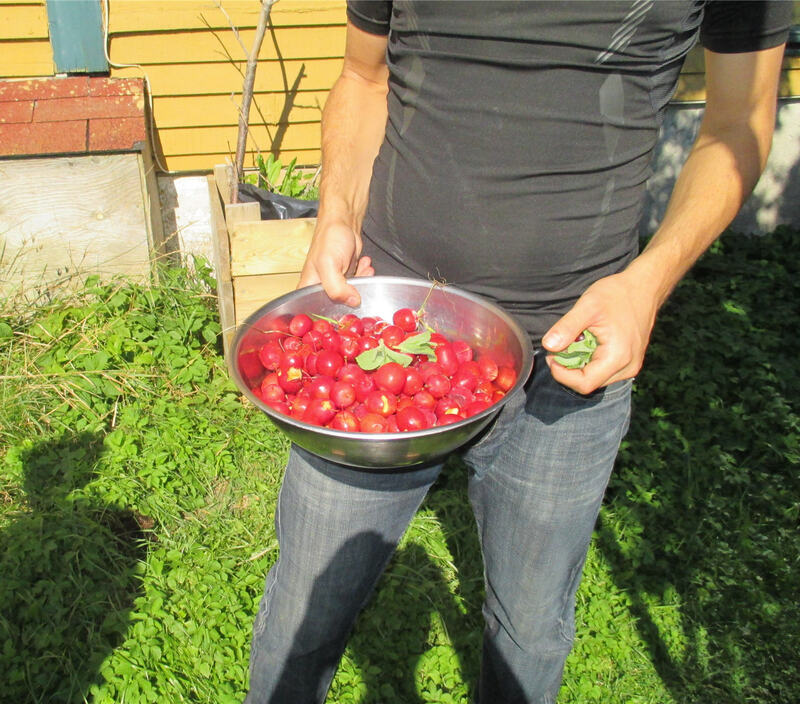 In the afternoon, we harvested rosehips for some magical recipes Elke has stored in the back of her brain. She’s been saying all week that the rosehips that grow around her property—and there are legion, believe me—are not very good quality. 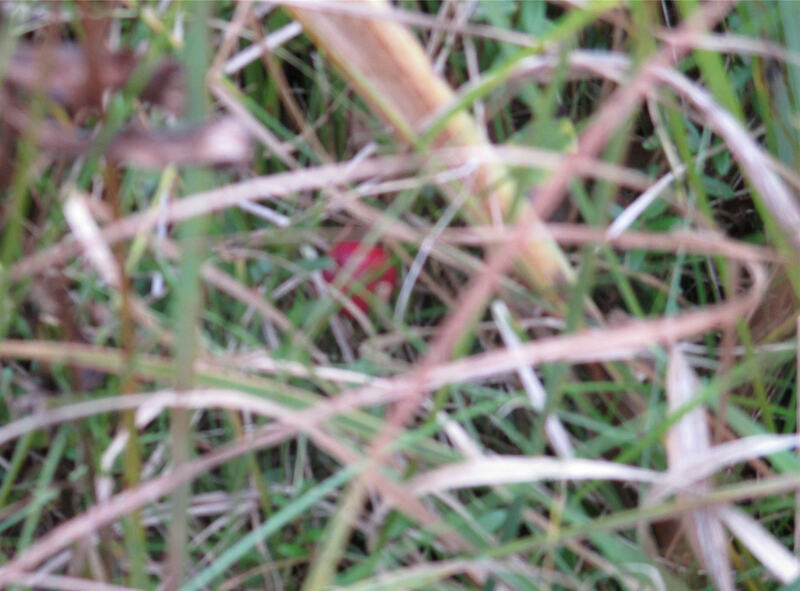 The wild roses growing in the pasture next to her home bear bright red rosehips, plump and inviting. 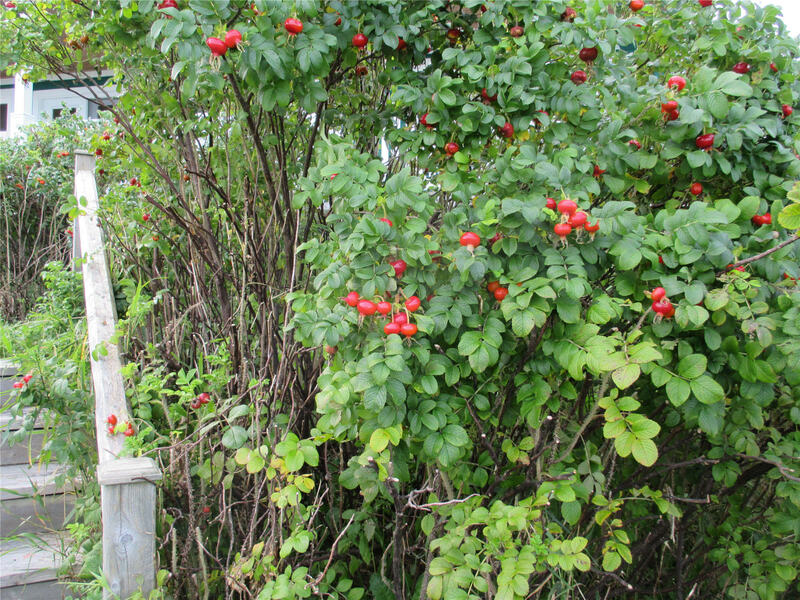 We drove to a friend’s home near Flat Rock, where the rosehips are purported to be better. Better is the wrong word to describe these astonishing creatures. They’re prodigious in size. Jumbo rosehips. Amazonian, even. And when you bite into one, it’s juicy and sweet. 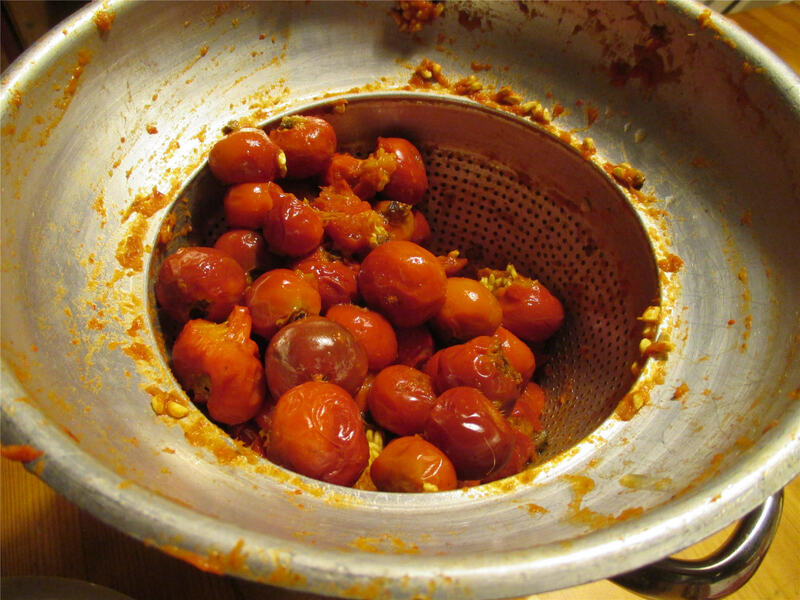 I tried making rosehip tea once, but my experiment was disastrous. I have a feeling Elke’s mysterious recipe will be anything but. After lunch, I sat down in the yard with my guitar. 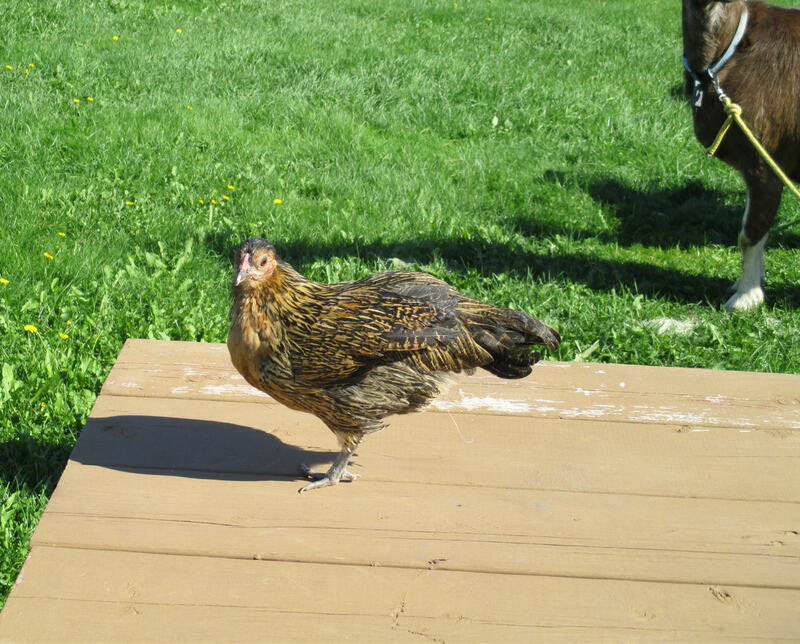 It was time to attempt to serenade Tai Chi the one-legged chicken. Elke had written to me that Tai Chi sometimes sings along with a CD of guitar music, so I was hoping that live music would have a similar effect. I’m afraid I had disappointing results. Tai Chi looked up from behind the herbs, ascertained that it was me, and went back to cleaning her feathers. She’s not into Stan Rogers and Bruce Cockburn. Maybe I should try something more traditional. 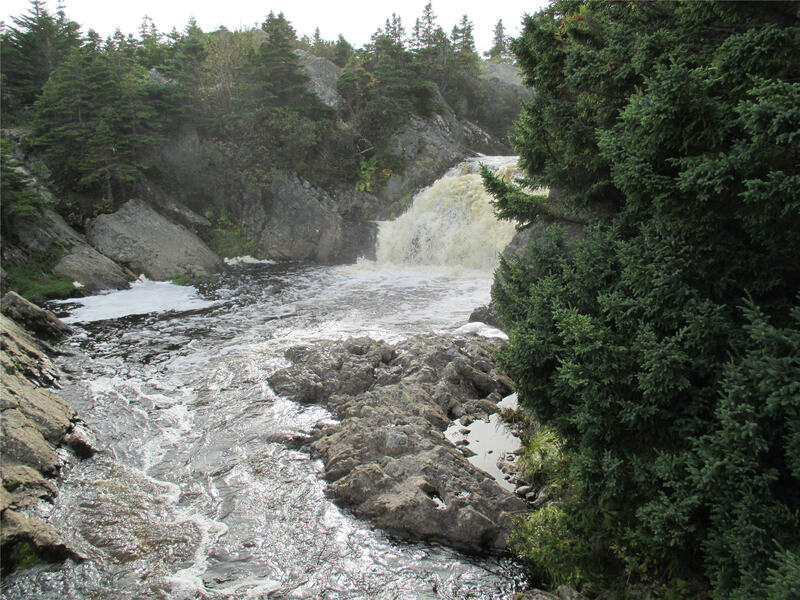 For a break from our labours yesterday, Elke took us on a short trail hike near Flat Rock. 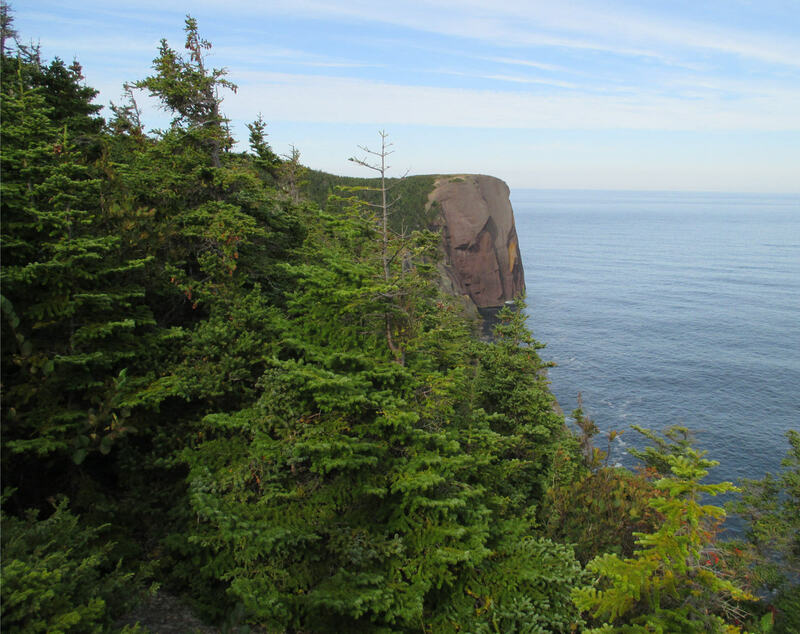 On the shore is a distinctive outcrop called Red Hat (not the Linux variety I’m used to). Elke is partly responsible for getting some of the best hiking trails (known as the East Coast Trail) I’ve ever enjoyed, all along this section of the coast. We hiked to a beautiful waterfall. 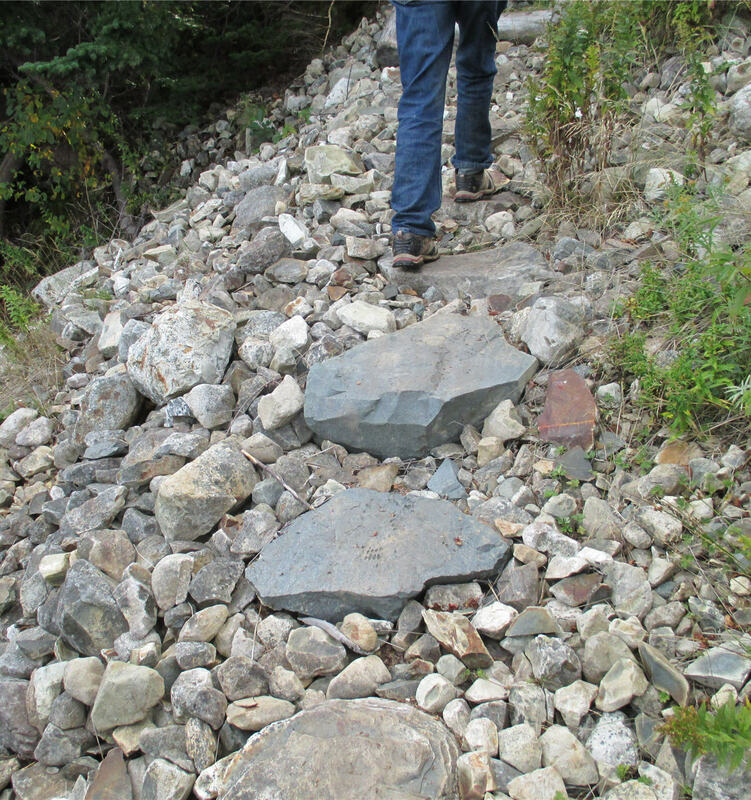 The land is quite rocky, so the trail builders took advantage of this fact to create an interesting and safe path. 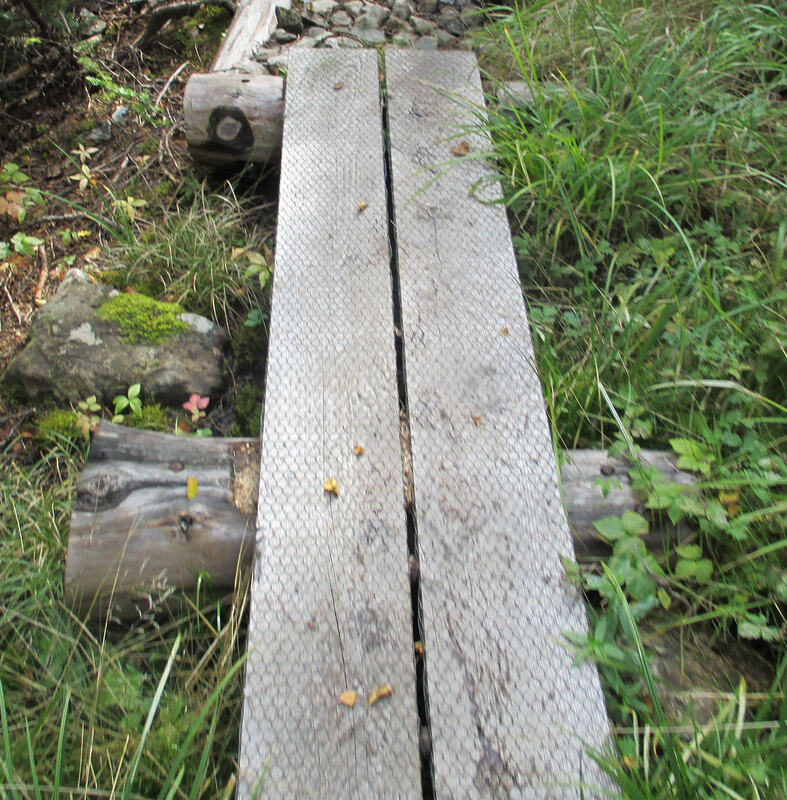 The trail can also be very slippery, so the catwalks are covered in chicken wire to give additional grip. 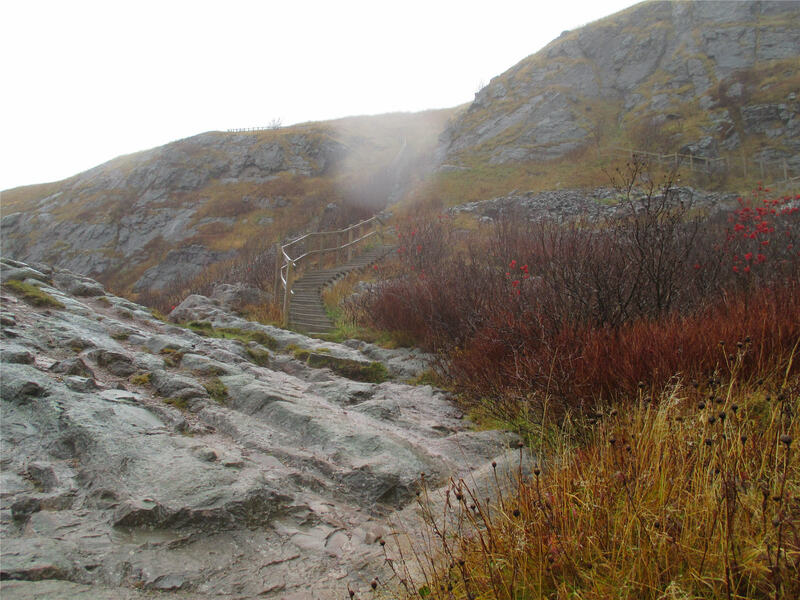 And because the trail follows the hilly terrain, the wooden steps are cross-hatched, again to assist with grip. 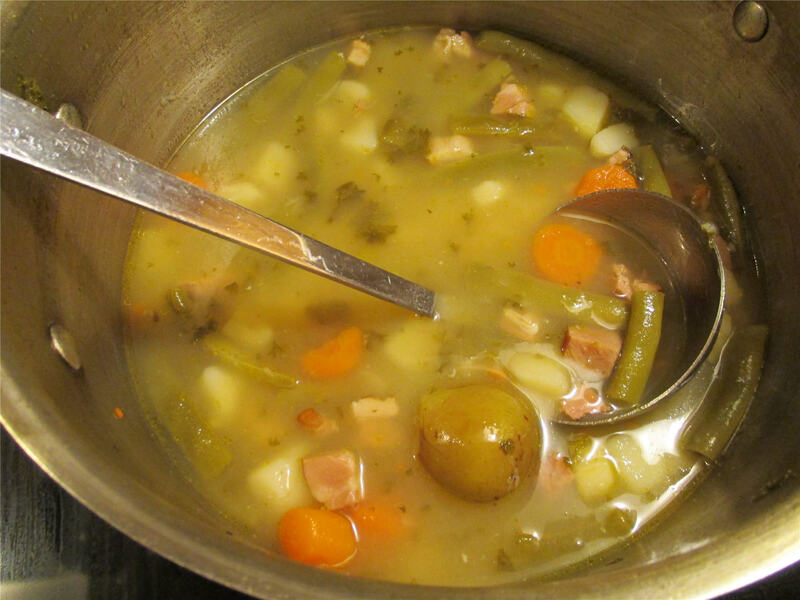 For dinner, Elke prepared a huge pot of pear soup, a traditional German favourite. It includes potatoes and carrots, smoked ham, and whole pears. We ate the soup with a big basket of garlic bread. Pear soup is now one of my favourites, too. After the table was cleared and the dishwasher loaded, we all retired to our respective rooms, totally beat. I slipped into the kitchen an hour ago to make a pot of tea. Elke’s light was still on, and I happened to glance into her room. She was reading a book. 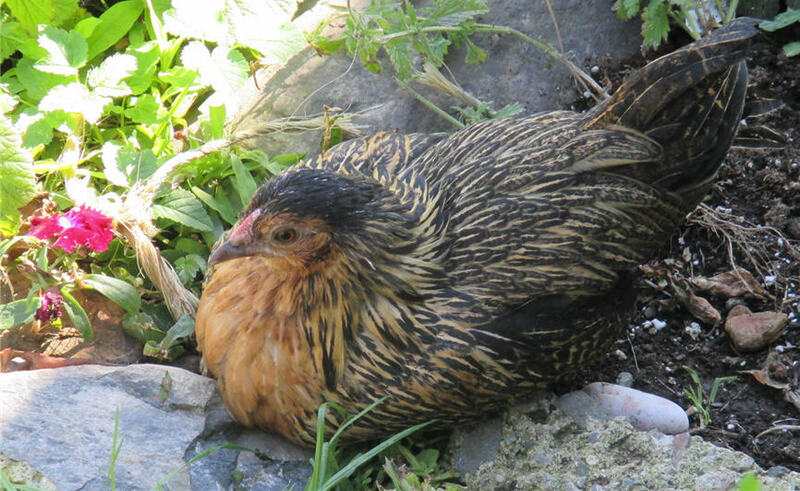 Nestled beside her on the pillow sat Tai Chi the one-legged chicken. For those of you who take working for a living for granted, I’ve discovered today that there’s nothing more satisfying than a day of good, honest labour, regardless of how you’re reimbursed. 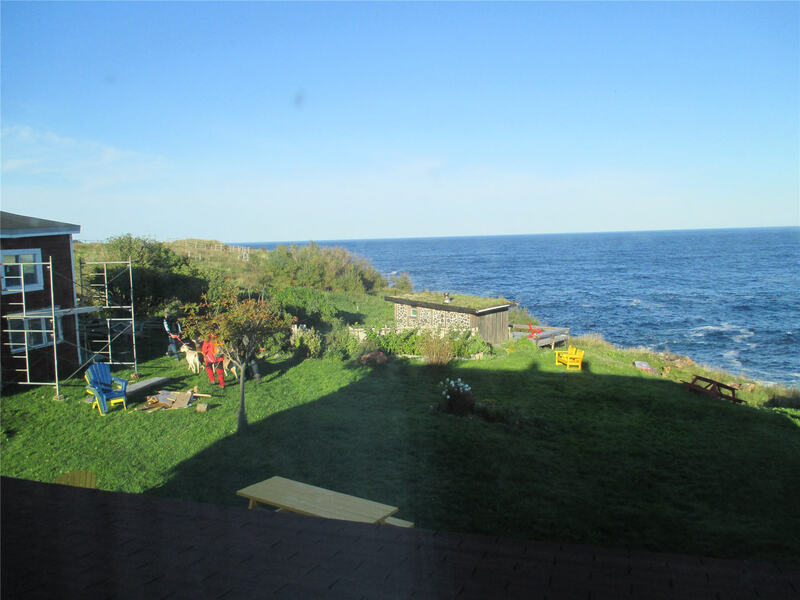 Three square meals—often hearty German fare but also sometimes my own French-Canadian recipes—and a warm bed with a view of the Atlantic, are the best compensation for a day’s work I can imagine. “Yes. Yes, I am!” I responded enthusiastically. 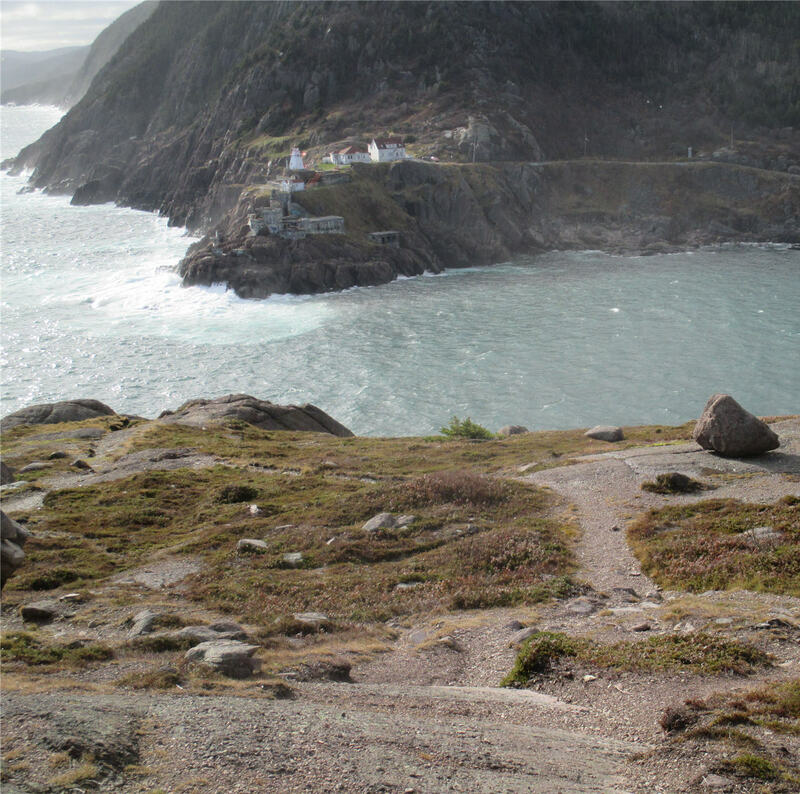 A Come From Away is a person not born on the rock. I may not have been born here, but I feel already as though I belong. When I left Toronto yesterday morning, my prayer to the universe was simple: just surround me with things, people and tasks that are needful, things I require and that give me a sense of contributing to a greater good. Needful things. The universe, I felt, could take care of what that meant. 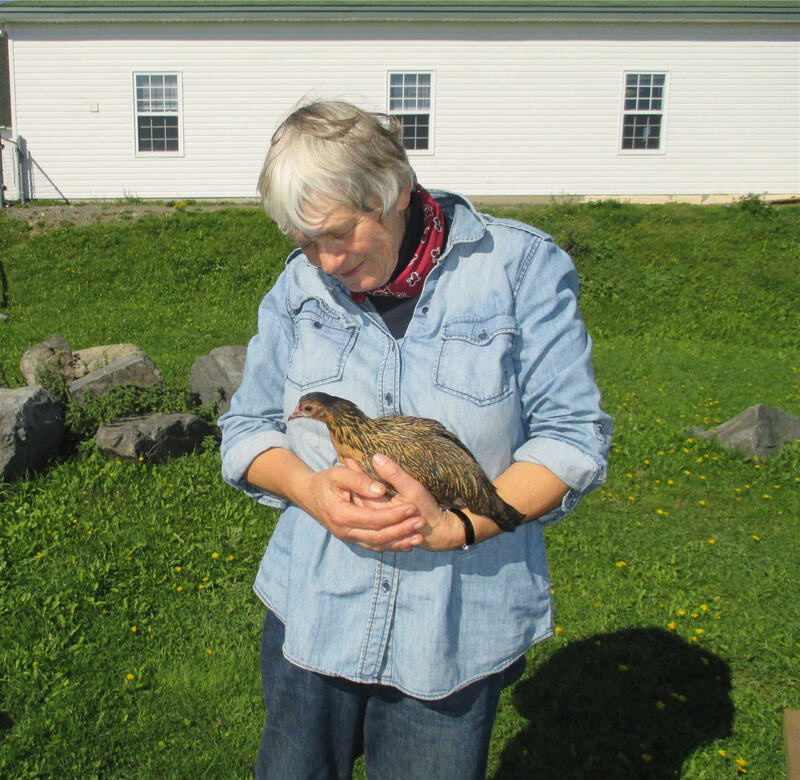 On my arrival to my farm (Points East), a neighbour took me to the Anglican church hall, where the town of Pouch Cove was holding their second annual Heritage Festival. Outside the hall, I met Elke Dettmer with her three goats, two of her chickens (along with three of their chicks), and three young WWOOFers. 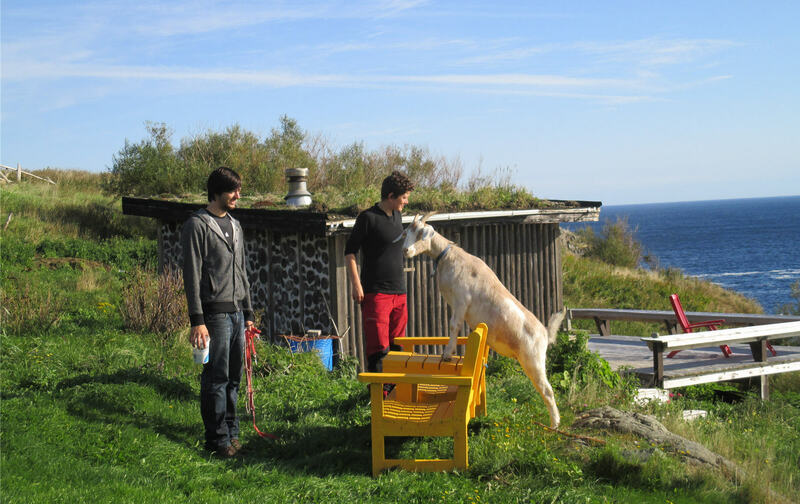 The WWOOFers were Keelan from Montreal, Sabine from Germany and Thomas also from Germany. The livestock and I got on like a house on fire. There’s Jenny the alpha goat. She’s the largest, and the darker brown shade. There’s Alice, a more placid goat who likes head scratches. And there’s Alice’s baby, Jill. Alice had two kids, named Jack and Jill. Jack has been sold off. “The male goats are trouble,” Elke explained. Then, there’s an unnamed mother hen and her chicks, which are still quite small and therefore live in a cage temporarily so they don’t get trampled by goats or teased by Nina the dog. Elke is probably protective of these chicks because of Tai Chi, the three-month-old, one-legged chicken. Tai Chi got her name because she had an accident the day of the town’s tai chi event. Tai Chi was accidentally trampled by a goat. This is one social chicken. She let me hold her, pet her, tell her my travel tales. Tai Chi then reciprocated by sharing some of her own stories. Here was my first needful thing. Alternate life forms and I have always had an understanding. 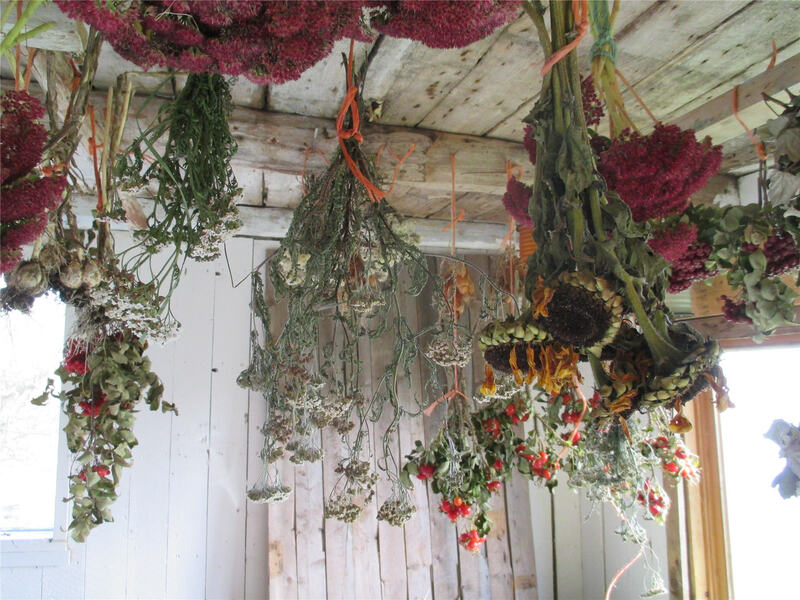 Once home last night, I noticed herbs drying from the rafters, and racks of bottles and tins with spices and herbs and teas. 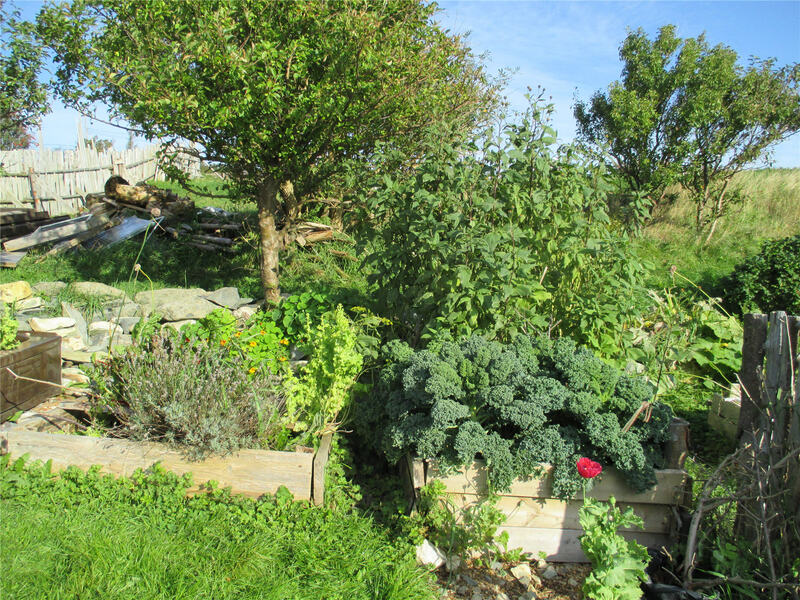 The yard includes several garden beds with greens and roots and squash growing all over the yard. 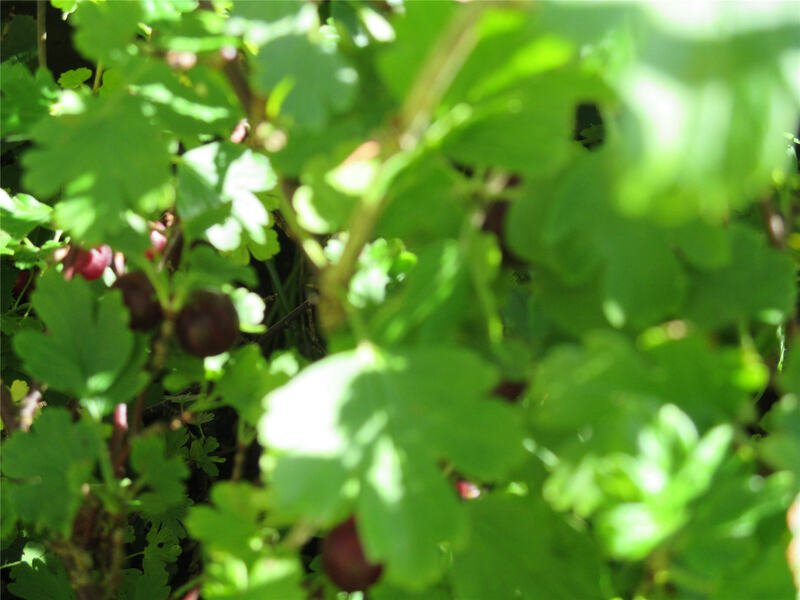 Currants, gooseberries, blueberries, strawberries, chestnuts. At once, I tucked in to the berries and the leaves. Across the way is a field of stinging nettle, dandelion, yarrow, mallow, wild aster, all ready for harvest. As I walked, I tucked in again. With this ready feast, I realized this was my second needful thing: to be able to feed myself spontaneously on something green and healthy. As well as Nina the dog, there are also three barn cats, all very social with anyone who wants to share the sunshine. 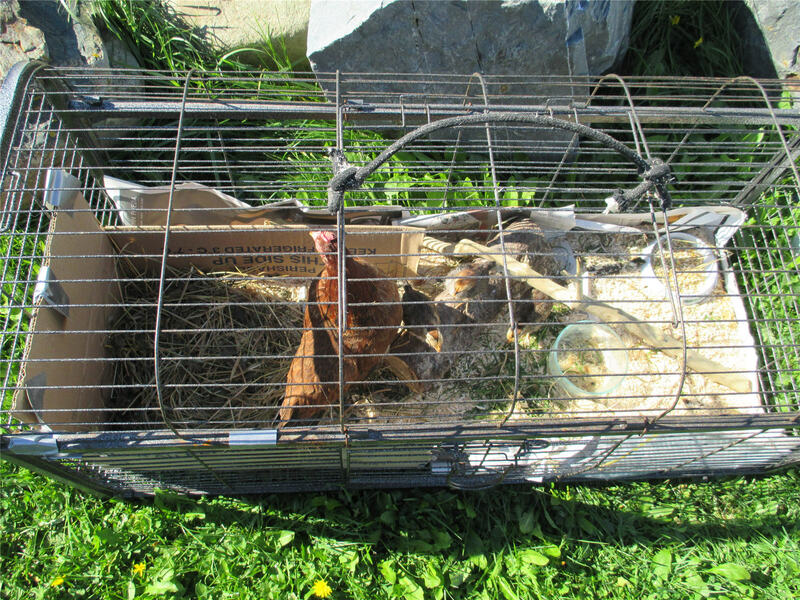 The cats protect the chickens, from weasels and the like. At bedtime, one of the young WWOOFers showed me to my room, a large space with a bed and a couch, a dresser and a chair. 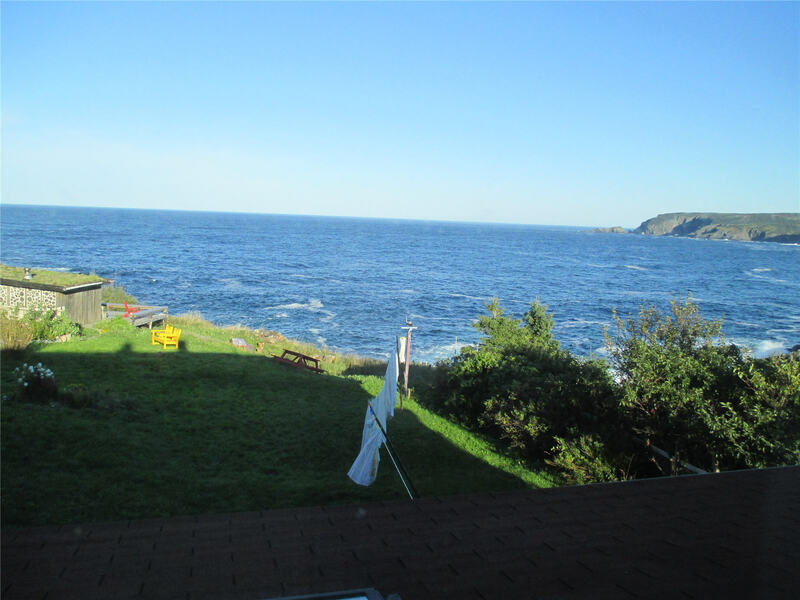 The view overlooks the cove, and out into the Atlantic Ocean. 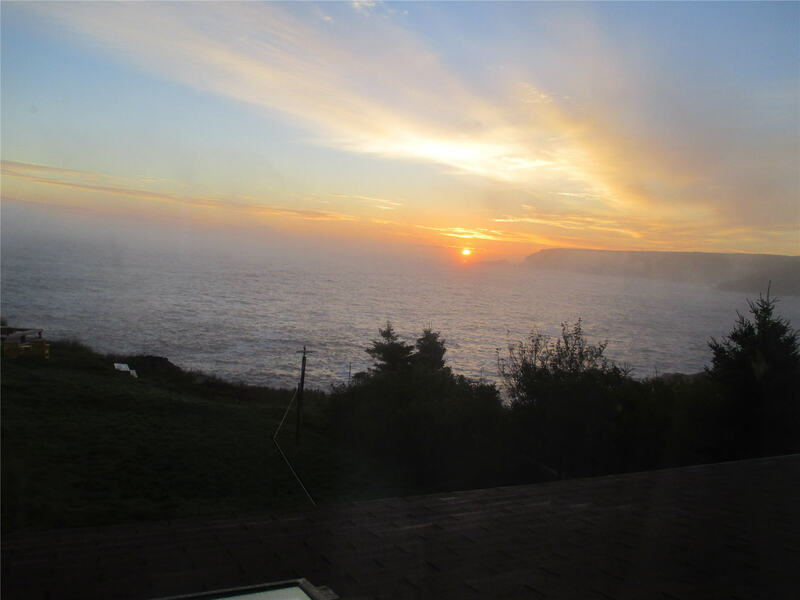 This morning I awoke (from the most amazing sleep I’ve had in two years) to a spectacular sunrise. You can’t just laze in bed when you’re faced with a needful view. There’s a small building out back of the main house, what Elke calls the Sauna. On the oceanside, there’s a deck. There, I got on my knees and laughed in pure happiness at being near goats and chickens, cats and dogs, people cooking hearty and sensible food, being able to harvest off the land, to share community naturally and kindly. I laughed that I felt at home. After breakfast, one of our WWOOFing duties involved the compost pile. Elke had started a pile last fall and wanted to move it over a few feet. There’s a lot of stinging nettle (which I assure you does sting, having trampled through it too much last night) on the property and her thought was to cover some of it with cardboard and then shovel some of the compost over top. Half an hour into the task, the day was beautifully hot. I rolled up my pants and tore off my shirt, leaving only my small light top. Keelan followed suit. Thomas and I loosened the compost with pitchforks while Keelan and Sabina shovelled the rich soil across to the other pile. Elke threw lime on, between layers. When Keelan commented on how drawn he always is to the life-giving properties of a compost pile, I joked that he and I were probably going to live to the ripe age of 115 just by standing in the soil with our shirts off. 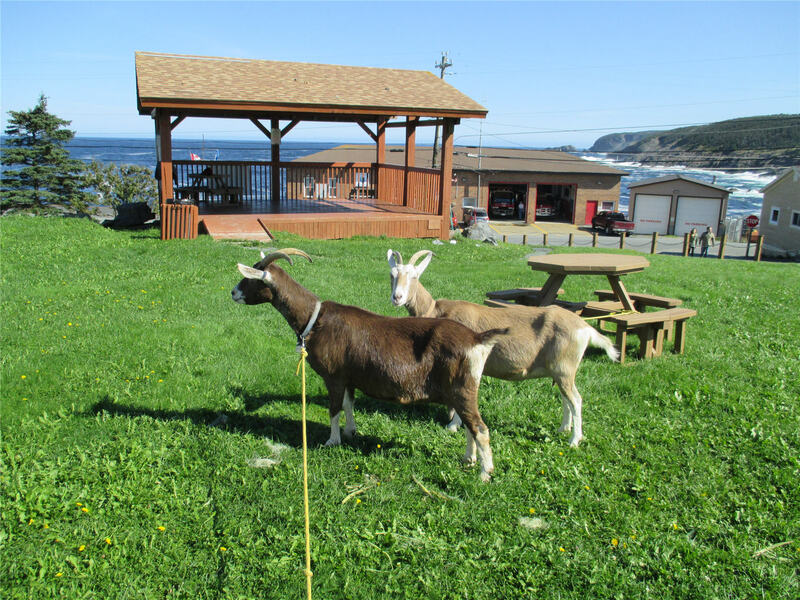 When our task was complete to everyone’s satisfaction, we headed to the goats, now tied to picnic tables in the yard. We’d found some wild wheat near the compost, which both the goats and the chickens eat as a delicacy. Alice and Jill both welcomed it; Jenny was less excited. Beside the goats, Elke was hanging out the laundry. While in Mississauga, one of the small pleasures I’d wished for more than once was a clothesline. I had two clothes racks, but the wind doesn’t go through those the same way, and they’re prone to collapsing and falling over. Here was yet another needful thing. I’ve come to realize that, while both the universe and I agree that I need these things to feel myself, we don’t always agree on the timing. A clothesline for the fall is a welcome addition. Today we returned to the Heritage Festival celebrations because there was to be live music, including a traditional band called Foggy Dew. We arrived to a packed house of locals listening to this band, which consisted of a guitar, a banjo, a bass guitar, a fiddle and an accordion, as well as vocals. With the first few notes, I realized this was the music I’d cut my teeth on as an adult. 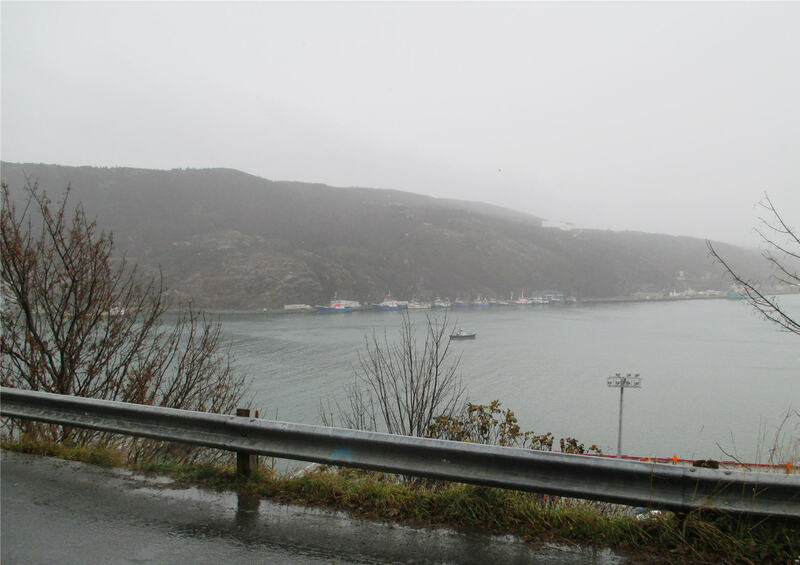 My guitar, mandolin and fiddle teachers, Greg and Ginny, had been married in Newfoundland, very likely in St. John’s. I knew some of these catchy tunes and was picking up the lyrics to others. An hour later, the recently elected mayor was invited to sing. He did several unaccompanied songs, including I Had But Fifty Cents. At the end of the event, Foggy Dew returned to the stage. Patrick Moran, the fiddler, stood up to the mic and sang I Had a Hat. With a little luck, I’ll meet some locals who are willing to occasionally accept a hack into their jam sessions, and I’ll be back to playing The Red-Haired Boy and Smash the Window, among others. And tonight, with no prompting to the universe at all, I’m sitting in bed with the window open, listening to waves from the Atlantic Ocean crashing against the shoreline on a peacefully calm evening. 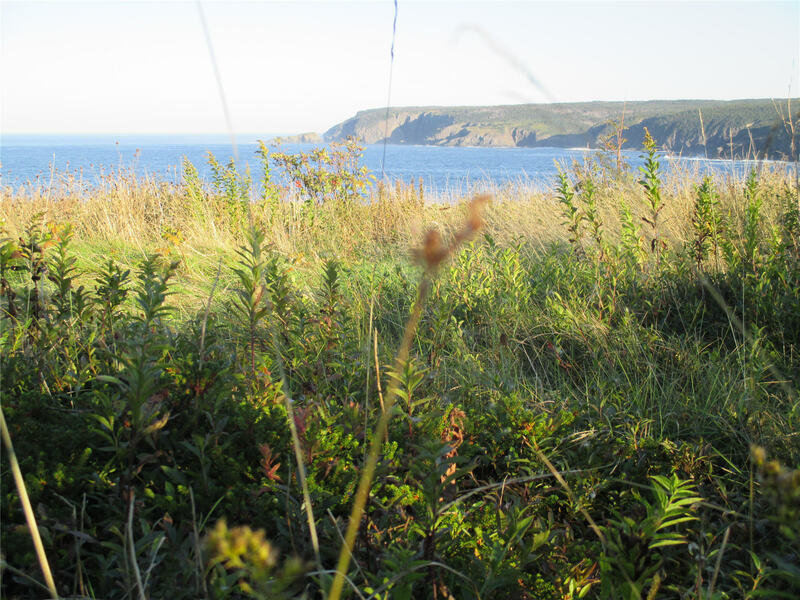 I know that tomorrow I will be greeted by roosters, chickens clucking to protect their peeping chicks, friendly goats, a dog begging for a hike along the shoreline, farmers eager to work the soil and share a life-giving harvest with an uninitiated by entirely enthusiastic Come From Away. I can’t wait.